SMILE, 2017. Bindis, jewels, thread on silk. 56" x 80." 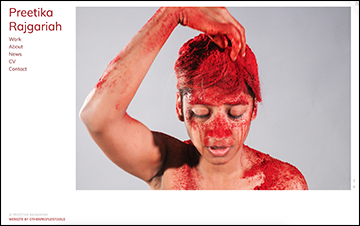 Interdisciplinary artist PREETIKA RAJGARIAH uses personal biography as a jumping off point in works that "challenge perceptions of exoticism and the sociopolitical standards in Indian and American cultures." Her performative photographs and videos investigate the nature of body adornment—which can paradoxically make us blend in or stand out, depending on the crowd. 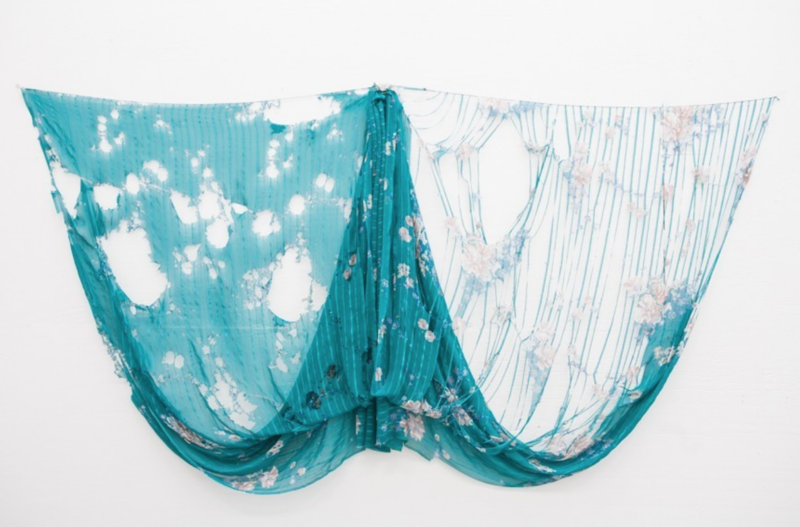 She gives decorative materials—ruffles, saris, bindis, henna, glitter, hair extensions—their own embodiment in sculptures and wall works, allowing the viewer to contemplate ornamentation without the body as a substrate. Preetika earned her BA in Studio Art at Trinity University in San Antonio,Texas. She completed her MFA in Painting and Sculpture in 2018 at University of Illinois, Urbana-Champaign. She was recently an artist-in-residence at ACRE and is headed to Oxbow in the fall. Her work will be included in a two-person show, opening at Roots and Culture (Chicago) in October. Preetika is currently preparing for three solo exhibitions in Texas in 2019: Tangled at Art League Houston, Sari Not Sorry at Lawndale Art Center (Houston), and a currently-untitled show at Women and their Work (Austin). Preetika lives and works in Houston, Texas. OtherPeoplesPixels: What does adornment mean to you? 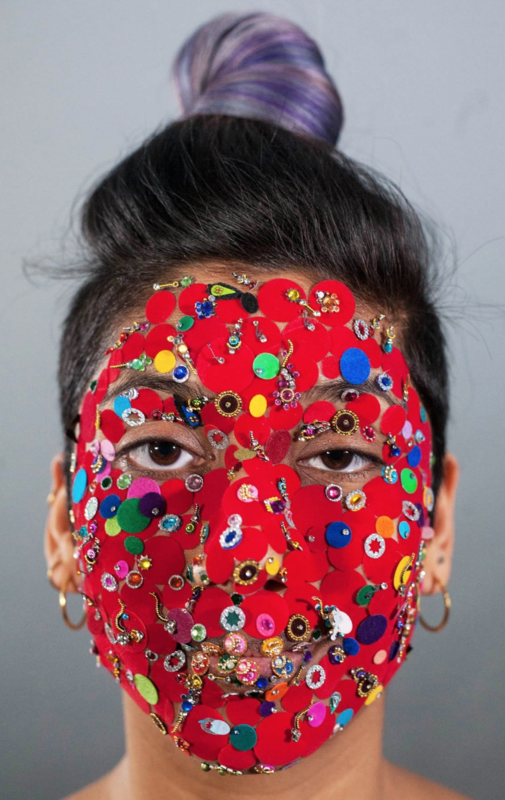 Preetika Rajgariah: Adornment represents choice—the choice to adorn or not—and pushing those boundaries. In my culture, adornment is expected for women to elevate one's beauty or status. . . growing up with the pressure to decorate oneself or present in certain ways is something I’m interested in challenging in my life and work. Beauty Mask, 2018. Digital Photo. OPP: What’s the role of exaggeration in your photographic and video works from Self? PR: I’ve often gravitated towards accumulation and repetition in my practice. More recently, I like to use my body as material to showcase this exaggeration. I’ve always been a bit of an athlete or a competitive person, so in the videos or photos, I am often in competition with myself. I am very interested in exploring my limits and defying my own expectations. So, these works explore limits and standards that are set by societies. How About Now?, 2017. Video performance with sindoor powder. 4:10 Excerpt from 20 minutes. OPP: Can you talk about additive versus subtractive processes in your series of modified Saris? Is the sari a symbol—if so, of what?—or simply a familiar surface in this work? PR: The sari represents familiarity and nostalgia while simultaneously embodying the exotic. It is a material that evokes memories of the place I was born, but it also signifies a culture that I sometimes feel extremely removed from. Typically, impulse and intuition lead the decisions I make in my practice. I MAKE first and foremost, no matter the medium I am using. 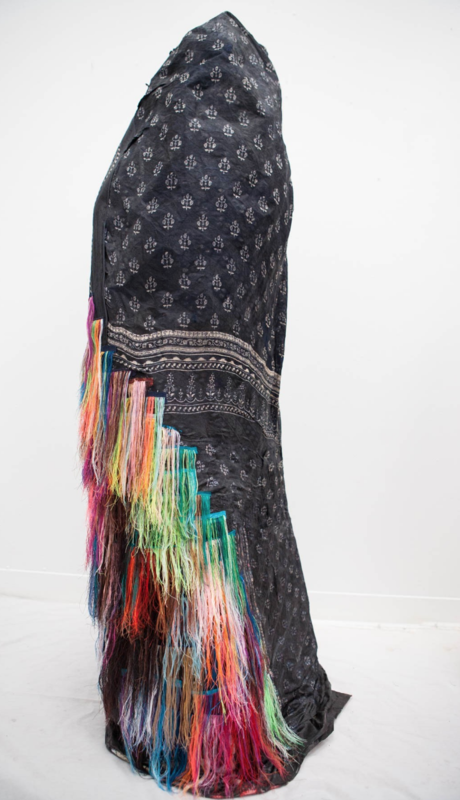 In the two dimensional sari pieces, I make formal decisions of addition or subtraction depending on each particular sari and the story that inspires the piece (yes, there’s usually a autobiographical narrative that informs each of my works). What we keep, what we leave, 2017. Sari with pyrography. 55" x 90." OPP: Both material and process play a big role in your work. Are you more driven by one or the other? PR: Both material and process are crucial to the content of the work. More often, I am drawn to material first, as it is extremely narrative driven, and then process comes in as my way of problem-solving. Coming from a painting background, I treat material similarly to paint. Formally, it is a large part of the beauty in my work. The materials I use in my work now—textiles, powders, henna—go way back for me. They are all materials that surrounded me daily while growing up. In this sense, I feel much more connected to my art and my work now than when it existed as just paintings. My processes—stitching, tearing, pouring, bleaching—are ways of handling of these materials that complicate, dismantle and re-purpose. OPP: I love the migration paintings. They teeter between abstraction and representation, and the marks remind me of thumbprints. Can you talk about the shift from these representations of the movement of groups of people to focusing in on the individual in recent work? PR: In recent years, as I have unpacked my own upbringing and personal life, the work has honed in on the individual as well. The migration paintings are directly related to my three dimensional sculptures—the aunties. I had wanted to make three dimensional versions of the paintings for quite sometime, and as I became interested in fabric and textile, experimenting with the new material lead me to create free standing, hollow sculptures made entirely from scraps of traditional silks - often saris that belonged to the women in my family. Hairy auntie, 2017. 25" x 60." OPP: Who are the aunties in Soft Bodies? Are these soft sculptures memorials to your real aunties? PR: No, the aunties are not specific to any real people, but they do embody a certain spirit so to speak. They are mash-ups of many dualities I experience: Indian/American, traditional/modern, masculine/feminine, past/present, hard/soft, etc. As I created these amorphous bodies, the narrative around their being came into existence. They are bold, resistant and a bit othered. They represent facets of my own personality as a bit of an othered woman in the American and Indian societies that I navigate, while also being stand ins for a tribe of aunties I wish I had had in my life growing up. To see more of Preetika's work, please visit prajgariah.com. from In the Heart of the Wood and What I Found There, 2017. Video still. 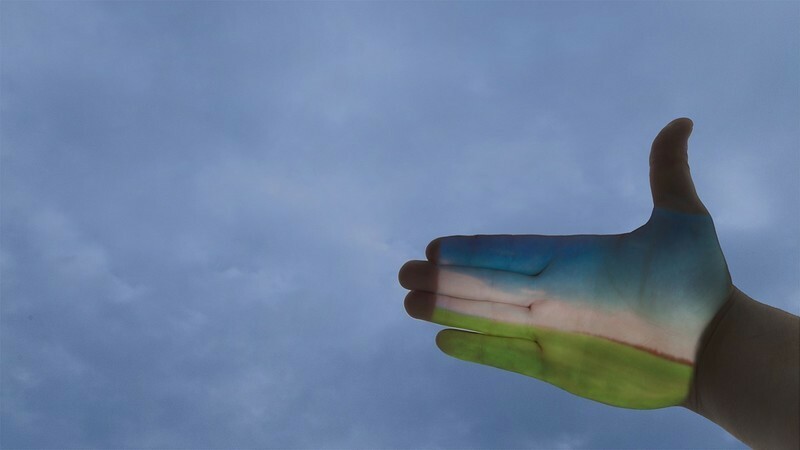 CHARLES E. ROBERTS III's videos, photographs and sculptures seem to be coated in a shimmery, metallic wet rainbow. 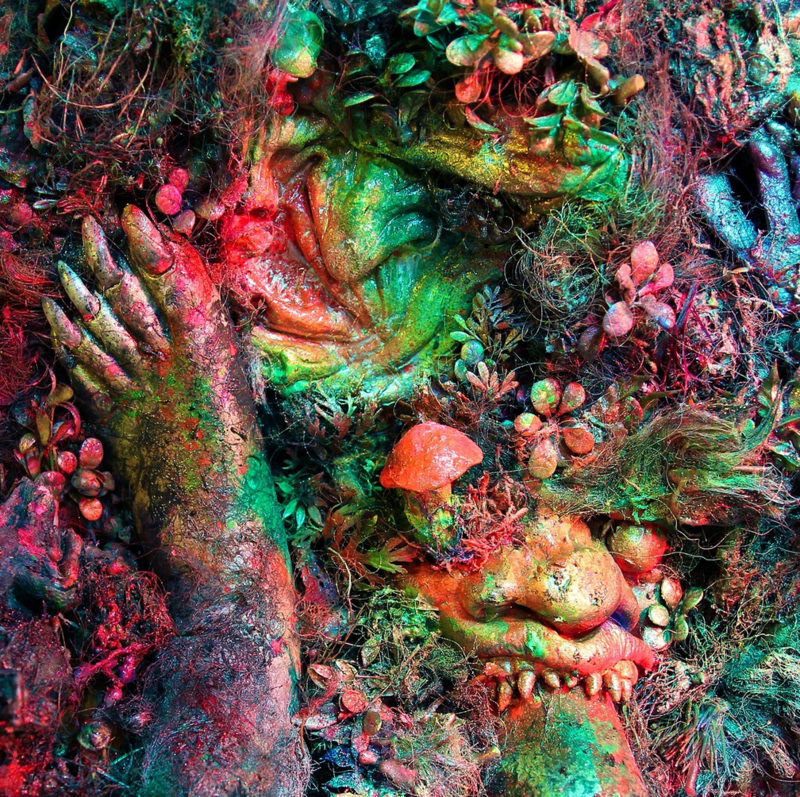 A consistent range of colors and textures—from slick and slimey body fluids to sparkly and glittery, crinkly plastic surfaces—create the sensation that his looped vignettes and video portraits all exist in the same world. . . a world which is not quite ours. Charles earned his BFA at The Art Institute of Boston in 1997. In 2017, his first solo show Oracles and Remains was on view at Show Boat Gallery, in conjunction with the 2nd Floor Rear Festival, and group show End of the World Part VII just closed at the Learning Machine in Chicago. He has screened his work at the Palace Film Festival (2015-2017) and exhibited at Zhou B Art Center, Naomi Fine Art and la Fundación del Centro Cultural del México. Charles lives and works in Chicago. OtherPeoplesPixels: Let’s start with the dominant aesthetic in your videos. How has your visual aesthetic evolved over the years? Charles E. Roberts III: This aesthetic has its roots in my very first attempts at making video. I needed an inexpensive option to light some sets that I had built in my studio, and a friend suggested using floodlights and clamp fixtures. The hardware store’s selection of colored floodlights was a little too tempting as I had just watched a bunch of Mario Bava’s color films. I didn’t leave that store with a single standard bulb, just a bunch of red, yellow, blue and green. I experimented with this palette for a couple of years, eventually adding some purple, pink and amber along the way. Wet and metallic surfaces seemed to have the most potential for harnessing all these colors, so I just tried to push it to an expressionistic extreme. Eventually everything and everyone was covered in some form of metallic paint or makeup. . . and lots of baby oil! Using a combination of silver, gold and bronze facilitated an even greater range of hues and temperatures within this very limited color palette. still from The Temple Theater of the Gruesome King, Act One, 2012. OPP: How does your aesthetic serve your conceptual interests? 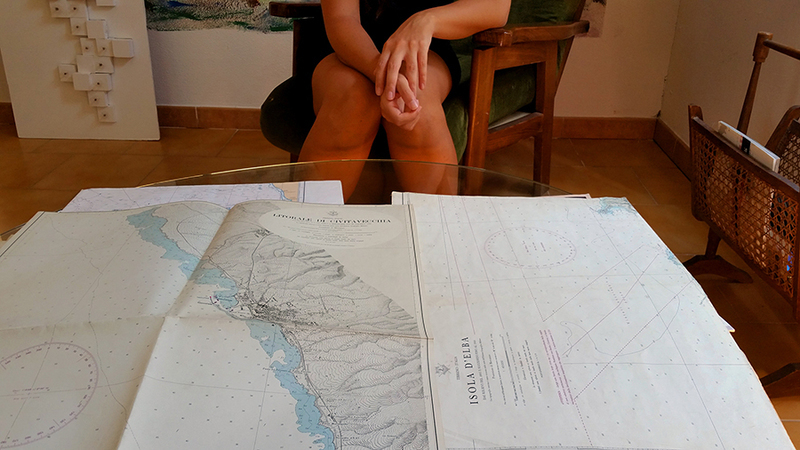 CER: I’ve always been more interested in using light to describe surface as opposed to space. There isn’t a lot of room for the viewer to enter my videos but I hope there is plenty to touch. The colors may be overtly ethereal and the subjects near-mystical, but I always try to anchor everything with an intense tactility. The Oracles videos are a good example of this. They are radiant and mystical beings but they are also grimy and encrusted with the materiality of their surroundings. We are a lot like them! After that series I felt that I had exhausted the use of metallics, only returning to them briefly in order to shoot an Eighth Oracle this past year. More recently I have been using white light, the colored floodlights tend to be set in the periphery and used more as accents. Things have gotten slimier though! 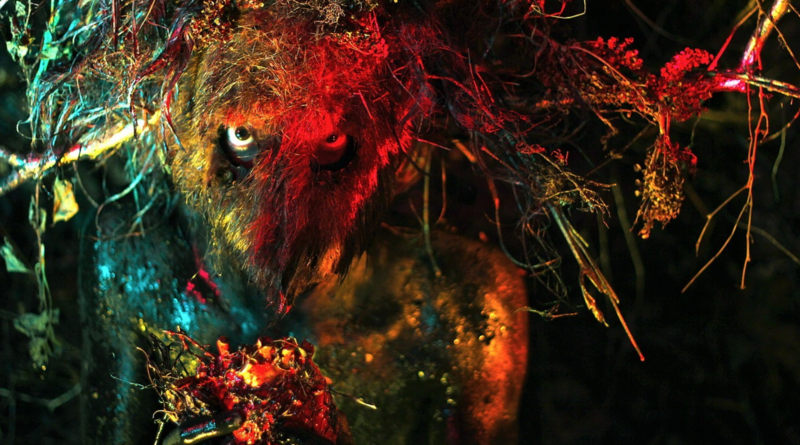 The Sixth Oracle, 2013. still from video loop. OPP: Are you influenced by 1980s fantasy cinema? I see Legend, Labyrinth, The Beastmaster and The Dark Crystal. CER: All of those movies were released and consumed countless times in my formative years, so I suppose they are the filter through which all subsequent influences must pass. The filmmakers that probably have had the most direct visual influence on me are Sergei Parajanov, Carmelo Bene, Peter Greenaway, Ken Russell, Jan Svankmajer and some of Fellini’s earlier color films. The surrealist Czech films of the 60s and 70s are definitely a big influence. I also love a lot of the production design and special effects in silent films like Benjamin Christensen’s Häxan, Murnau’s Faust, Lang’s Die Nibelungen. . . and L’Inferno, an incredible adaptation of Dante’s Inferno from 1911! OPP: Any other visual influences? CER: My background is actually in painting and drawing. I spent a lot of time as a young, and not so young, adult immersed in the tomes of art history. Gustav Moreau, William Blake, Francisco Goya, El Greco, Caravaggio, Albrecht Durer and probably the whole of the northern Renaissance probably loom more profoundly in my imagination than motion pictures. Children’s book illustrators like Arthur Rackham and Maurice Sendak are some other early but unshakable influences on my visual vocabulary. Folklore, fairytales and mythology have also been a constant inspiration. OPP: Recent short videos like Last Kiss, Heal me, my darling and pink nail polish (I Can Never Go Home Again), all from 2016, seem to be vignettes that might be part of a larger narrative. Is this case? What’s the relationship between these individual works? CER: These three videos actually have the most direct link to any fantasy films of the 1980s though they are a more recent influence. There was a genre of Hong Kong and Southeast Asian horror films around that decade dealing in a lot witchcraft and black magic. The gore and special effects in those films was by no means realistic, but it was highly imaginative, colorful and often truly repulsive. I thought it would be interesting to apply these outrageous aesthetics to some very intimate human scenarios. Maybe a kiss, a massage and a comedown could take on more mythical proportions and suggest a multitude of fantastical narratives. I also really wanted to play with scale. 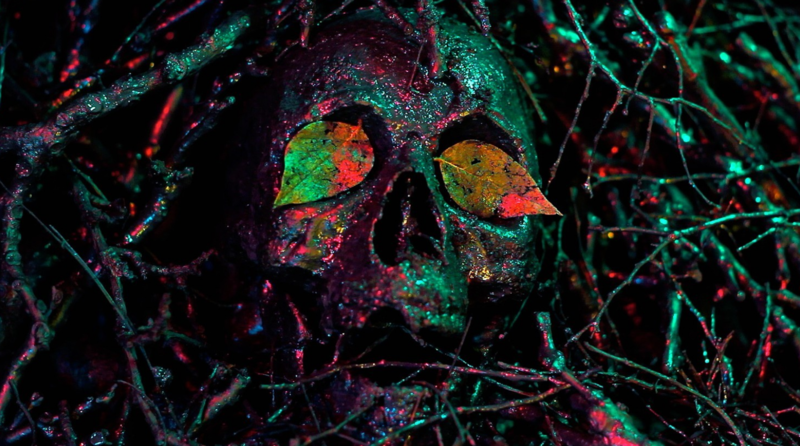 All three videos are shot in close-up and are incredibly claustrophobic in their framing, but the detailed makeup and prosthetics potentially suggest an epic landscape in motion. The response to these videos is often “I can’t wait to see the finished piece!” Initially I was a little embarrassed and disheartened by these reactions but in the end I have to see this as some kind of success. If the viewer anticipates something beyond what I’ve given them, I’m probably doing something right. pink nail polish (I Can Never Go Home Again), 2016. Music by Michael Perkins. Featuring April Lynn. OPP: I’ve only seen your videos on the internet. What’s the ideal viewing space for your videos? What about scale? CER: I definitely prefer most of my video to be viewed as loops on monitors, installed in a gallery or some public space. I’m not that interested in the captive audience of a screening or the inclination to continually move on to the next thing that occurs when we watch things via the internet. Last Kiss, Heal me, my darling and pink nail polish are all intended to be viewed as continuous loops. When viewed online or at a screening the “second half” of the video is actually just the first half in reverse. This edit allows for the video to be seamlessly looped when displayed in its preferred context. I like to think of them as infinite moments that a potential viewer could walk away from, return to over and over again. . . or even just ignore if they weren’t interested. Maybe they are a little more like painting or illustration in that way. Though I've been impressed with seeing a number of my videos projected on a larger scale I still prefer them to be viewed on monitors. I love that quality of the illumination coming from within, like stained glass in reverse. The Oracles especially benefit from this format, in fact it’s really the only way to experience them. They were all shot in such a way that the monitor that they are displayed on needs to be installed vertically. 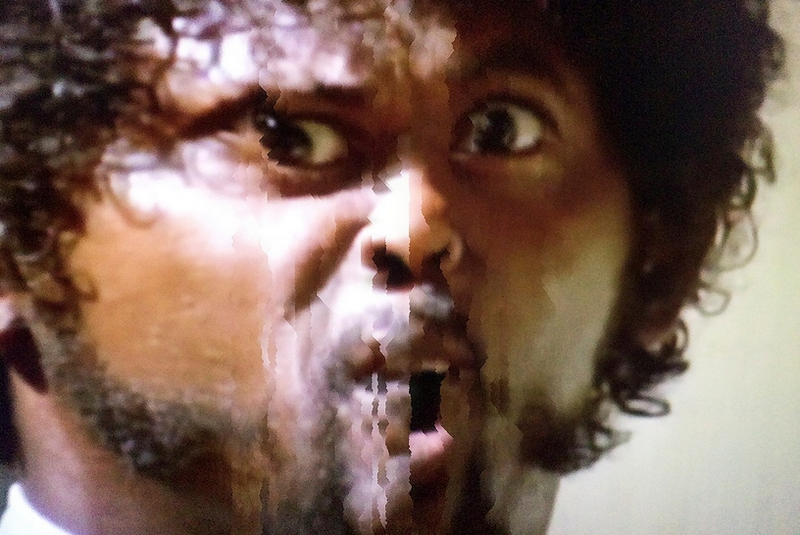 OPP: You have a section of video stills from an in-progress project that you’ve been working on since 2011. When will In the Heart of the Wood and What I Found There be complete? What’s the overarching narrative? Has it changed over the years? CER: I started this project in 2011, and it was initially intended to be a very short piece. After shooting the bulk of the live action material I started experimenting with some stop motion sequences. I was having too much fun composing and animating all these muddy landscapes with various branches, twigs, leaves, bones and skulls. I amassed an almost unmanageable amount of material and eventually put it aside to work on some projects that might have more immediate results. I didn’t return to In the Heart of the Wood until the spring of 2016. I edited continuously and even shot some more stop motion sequences over the course of about nine months. Again, I do not have any specific narrative in mind. The whole thing seems to be shaping up to be a sort of ambiguous folkloric fantasia that takes place in the haunted forests of my youth. I’ve yet again had to set this project aside to prepare for some shows and attend to some other muses. I’m not sure when it will be finished but there is definitely some thematic and aesthetic crossover with the piece that I am working on now. In fact, one might even consider my current project a more sexually charged Dark Crystal! OPP: Well, now you have to tell us about that! CER: A couple of years ago I was working on a series of photos under the working title of the Garbage Forests. I used a lot of repurposed latex Halloween masks, ratty wigs, plastci flowers, holiday decorations encrusted with mud, glitter and foraged urban flora. This is basically going to be a series of short videos with performers bringing all this stuff to life. Right now I'm building the costumes and prosthetics for a masturbating mushroom goblin and a woodwose murdering witch. It's sort of a confrontation between childhood and adolescence. To see more of Charles' work, please visit charleseroberts3.com. 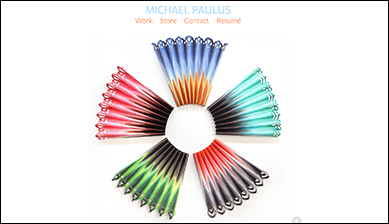 Interdisciplinary artist MICHAEL PAULUS works in video, painting drawing and sculpture. From his slow, lulling videos of repetitive phenomena to his pithy, layered drawings of the imagined skeletal systems of well-known cartoon characters, he expresses both awe at the natural world and criticism of the constant human drive to manipulate it. Michael's videos have been screened nationally in Seattle, Washington; Portland, Oregon; and Austin, Texas and internationally in Taipei, Taiwan; London, England; Banff, Canada and Basel, Switzerland. Most recently, Wind Farm was included in the Gödöllo International Nature Film Festival (2015) in Gödöllo, Hungary. Michael is currently hard at work on a collaborative, multi-media project with Glenna Cole Allee that examines "the ghostly remains of the annexed people and township from the Hanford Reach." 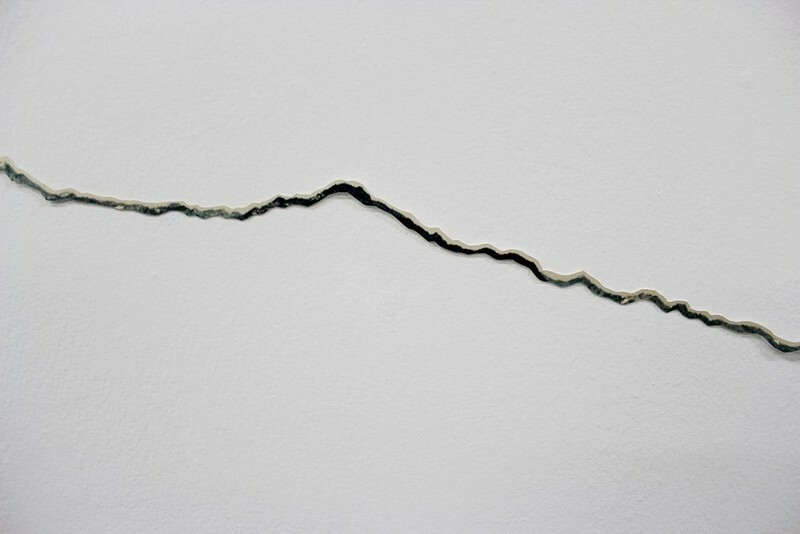 In 2015, he exhibited work in Obsidere, curated by MicroClimate Collective in San Francisco and had a solo show called Claimed, Found and Gifted at Oranj Studio in Portland, Oregon where he lives and works. OtherPeoplesPixels: You work in drawing, sculpture, painting and video. What’s the underlying thread tying together all your work in various media? Michael Paulus: I’ve never had a very disciplined studio practice, investing in technique and familiarity with a chosen medium. I’m generally restlessness with sticking with one medium. I do recall very much my foundations professor Greg Skinner at Cornish College in Seattle impressing upon me to “choose the medium to suit the vision, not the other way around.” He was a conceptual artist coming out of the post-minimalist 60s. Actually, I came back to visual art about 15 years ago after burning out on the two-dimensional image and the limitations of illusion, which brought me to sculpture after a couple-year-long hiatus, during which I was more concerned with creating audio compositions. The mediums do differ throughout, and the work tends to be motivated by a respect of this natural world, as well as a critical view of the awkward attempts we humans make to define and control it. OPP: You’ve drawn the imagined skeletons of 22 well-known cartoon characters in Character Study. Does personal fandom play into how you selected your subjects or is it more about the bodies themselves? Can you also talk a bit about the urge to deconstruct childhood icons? MP: The cartoon skeletons were really an exploration and experiment to deconstruct iconic figures from my childhood. In their day, these characters were stand-ins and figureheads for many. Actually, I never had much interest in comics, and I really do not like the act of drawing, so that project was a bit of a challenge for me. 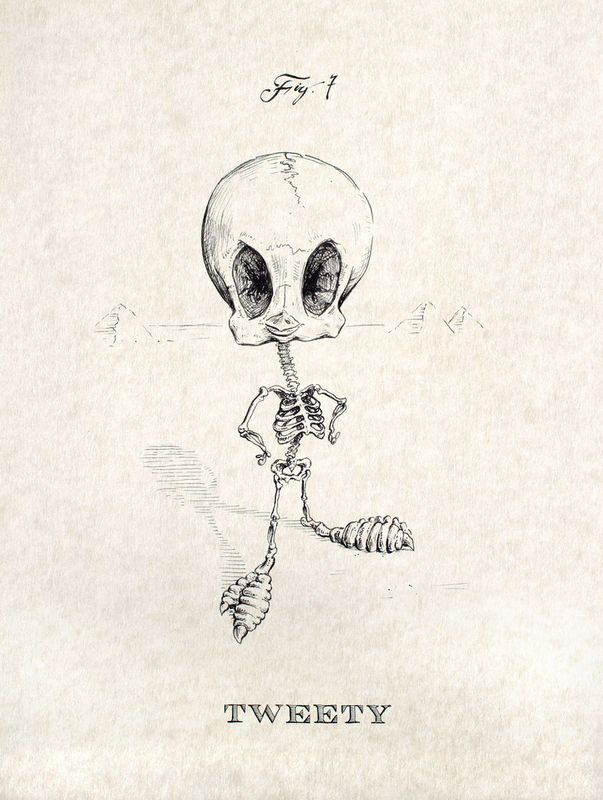 I had the notion to do somewhat literal drawings of their very physical bodies (skeletons in this case) in a kind of medical or devinci-esque rendition and apply a hinged, translucent digital overlay of the flat and colorful cartoon image over the top, intentionally retaining the pixilation and artifacts that came with them when pulling the figures off internet searches. The intent was to have an onion skinning, transparent layer with the drawing underneath, like the anatomy books I paged through as a youngster with the various Mylar layers of circulatory, nervous, cardiovascular systems, till finally one is left with an opaque skeletal system, which cannot be denied. I chose Charlie Brown and Hello Kitty first, as they were both very iconic and grotesquely distorted from the original human or animal from which they were derived. For the rest of the series I did the same. I retained the general skeletal system of whatever their actual origins were, regardless of how anthropomorphically derivative of a cutesy human they were with speaking mouths and huge eye sockets. OPP: It seems you’ve been focusing on video work in the last few years. Videos like Vertical Migration (2014), Wind Farm (2014) and Dip (2013) all have a slow, contemplative quality. To me, they are all about the value of slowing down to look at what we might be missing and the beauty of cyclical repetition. Earlier videos like The Journal of John Magillicutty or: The Time Afforded To One Lucky Enough To Be Living Comfortably (2006) and The Preoccupied Occupant (2009) have all those same qualities plus humor and a little absurdity. Thoughts? MP: Well, I suppose I tend to look at this life a bit distanced. Both critical and amazed at what it is all about. And I certainly like combining contrasts and the marriage of opposing elements, kind of a ‘more than the sum of the parts’ kind of thing. So, yes, there are some outright absurd and comical elements in contrast to and as a kind of veil over the profound. It’s possible that I’m self-consciously masking spiritual leanings I have or constructing a retainer in case I stray too far. I grew up with contrasts in a family of Catholic faith but where science and logic was king. I am conscious of this instinct to manipulate and control the world around us: designed dog breeds, damned rivers, foie gras, binary codes. The cyclical repetition is a result of this constant. I suppose, it’s a kind of a meditative response in the face of absurdity or incomprehension. General paranoia in our culture and surveillance flavor my recent work. I am currently working on a couple projects examining the paranoid undercurrent. One is a small but ongoing attempt to finish a video where I am matching shot for shot the opening sequence from the ubiquitous movie The Shining. I am matching the locations and the blocking of the movie’s ominous, helicopter eye in the sky intro sequence as it looks down, following the subjects as they wind up the mountain. . . but in this case looking back up at it. Another very multi-media project is working with artist Glenna Cole Allee on an interactive piece that examines the ghostly remains of the annexed people and township from the Hanford Reach in what became The Manhattan Project’s plutonium-producing mega-site in the scablands of Washington state—now also the notorious Superfund cleanup site. It’s a large undertaking incorporating massive stills, video, projected audio elements spoken from natives and some sculptural constructions. OPP: Please tell us about your most recent body of work Claimed, Found and Gifted. What’s the significance of the blades of grass your drawn versions of the hands on the Lincoln Memorial? Why have you revisited Abraham Lincoln again after a decade? MP: Well, I was offered an opportunity to exhibit some new work along with existing pieces so I decided to explore where my head was at 10 years prior in a show I did titled The Stars and Abraham. I found myself a bit perplexed in how I had merged the myth and popular vestige of Abraham Lincoln with astrology and its arbitrary symbolism. More to the point, of how they relate in Americana folklore and institutions for the faithful believers in both. I certainly held Mr. Lincoln in high regard since childhood for his virtue and fortitude. Most of this was drilled into children in grade school it seems. Honestly, it was a bit of an awkward exercise with that association between the two; comparing Lincoln’s vacillation between right and wrong, this and that with the union and slavery. Anyways, I borrowed from Lincoln again. In addition to the cascading stovepipe hats upon pretzels and hotdogs, I inserted blades of very suburban, green grass clenched in the Lincoln memorial hands—just more Americana from a child’s backyard looking up at the sky. And, as a counterpoint to the somewhat austere and critical renditions involving Abraham, I created large, rag-paper fans in full, saturated, color from fabric dye as a celebration of his sensual and feminine counterpart, Mary Todd. . . or, my creation of her into this complement to him. The exhibition title Claimed, Found and Gifted refers to the idea of American expansionism westward, manifest destiny and eminent domain. One piece, the broken and elongated pop American tchotchke black panther titled American Endurance—(the Creep) is basically the title piece. 96 Blots with designer and artist Trish Grantham. OPP: Your painted walls resemble wallpaper in their repeated patterns of flowers and Rorschach blots, but each image is uniquely hand painting. Some are the interiors of private homes; others are in bars and restaurants. Did these folks seek you out or did you bid for the jobs? Can you offer any practical advice for artists who want to do commissioned work? MP: I have been doing work like this for a while. I first began with commercial work in a more corporate environment, designing and building permanent art installations for the offices and conference rooms of a large company. 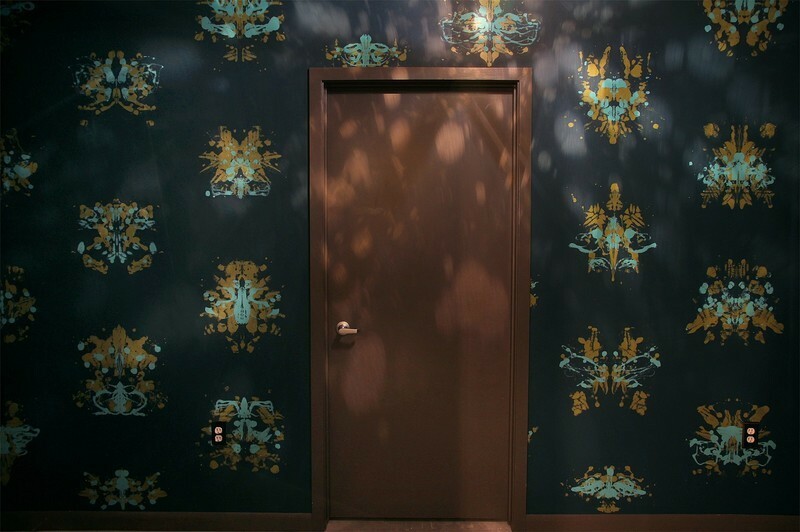 The patterned “wall paper” painting began really with Angle Face bar in Portland, Oregon, owned by John Taboada and Giovanna Parolari. It’s kind of a tweak on the current trend of wallpaper and repeat patterns, but with an application by hand so that each motif is unique. My fine art practice and discipline as I said earlier is lacking at times and I consider myself aligned with a design instinct more than I would have appreciated when I was younger. Do I actively search out paid work like this? Not so much. That is a great benefit of the World Wide Web really, in that it is very helpful for individuals dealing in visual images. To see more of Michael's work, please visit michaelpaulus.com. Combining digital projection, wood and ceramics, KYLE TRIPLETT evokes vast, outdoor places within the confines of the gallery. The romantic, the picturesque and the artificial are foregrounded in his simulated landscapes, but each is very much a real place. His backlit digital prints, which began as documentation of his installations, capture the wistful, longing figure in relation to his created spaces. Kyle received his BFA from Southeast Missouri State University (2008), a Post-Baccalaureate certificate from Louisiana State University (2009) and his MFA from Ohio University (2013). He's been an Artist-in-Residence at Red Star Studios (2015) in Kansas City, Watershed Center for the Ceramic Arts (2014) in Newcastle, Maine and Kansas State University (2013-2014). His most recent solo exhibition False River just closed in March 2016 at Yeiser Art Center in Paducah, Kentucky. 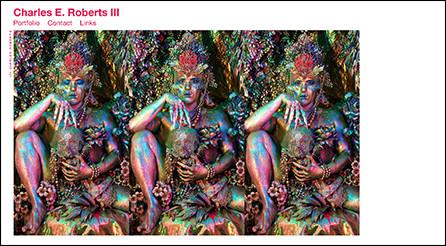 Kyle's backlit photographs are currently on view until May 21, 2016 in the group show Garden Party, alongside a collaborative sculpture with Rain Harris (also of OPP blog fame), at the Belger Art Center in Kansas City, Missouri. Kyle lives and works in Ruston, Louisiana. OtherPeoplesPixels: In your statement, you say "I am interested in producing work that is specifically of place, as opposed to work about place. That is, asking questions and responding to the ‘virtual here and there’ rather than traditional ideas of site specificity." Could you parse this out further? 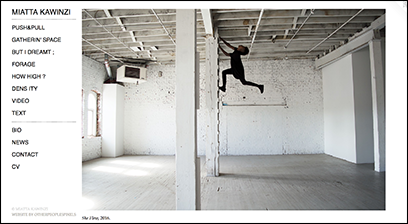 Kyle Triplett: My installation work is rooted in the desire to create place. I’m interested in using the space of the gallery as a platform to create an imagined, constructed landscape as opposed to recreating a known or remembered experience. The work is site-reactive in that the gallery only dictates the size of the piece. Other than that, the work is not about a specific site. It’s about constructing a structure that attempts to hit most of the notes that a real landscape does. I approach the work with the understanding that it’s fundamentally impossible to recreate nature, but I think there is something compelling in the attempt and failure. 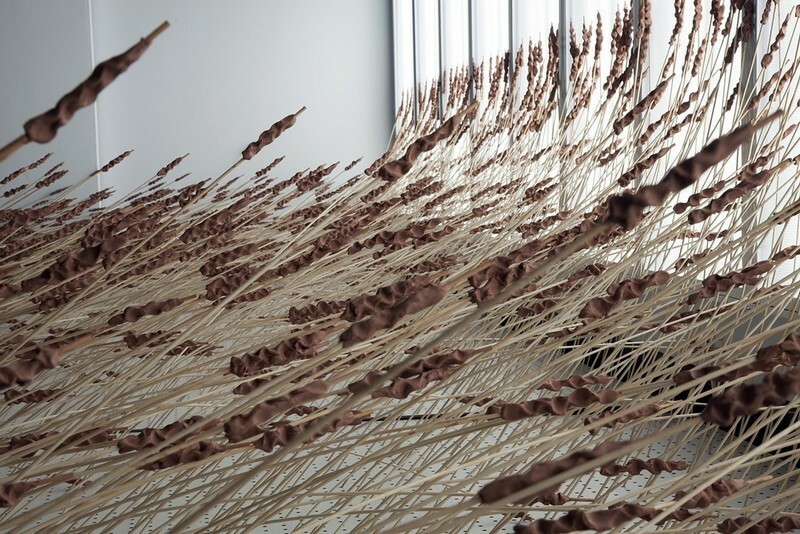 The number of individual elements that make up a scene is a little maddening, but again, there is something interesting in the attempt to create a landscape one single grass blade at a time as in Untitled, OH #8. OPP: You employ ceramics, wood and digital projection to create immersive environments. What was your first medium and how did you come to this balanced combination of the digital and the tactile? KT: My first experience with ceramics, like most, came through pottery. I took a ceramics class in high school and really enjoyed it. I took another ceramics class in college after three years pursuing a degree in American History and haven’t left it since. At the beginning of the last semester of undergrad, I shifted away from pots and started making ceramic-based mixed media sculpture. 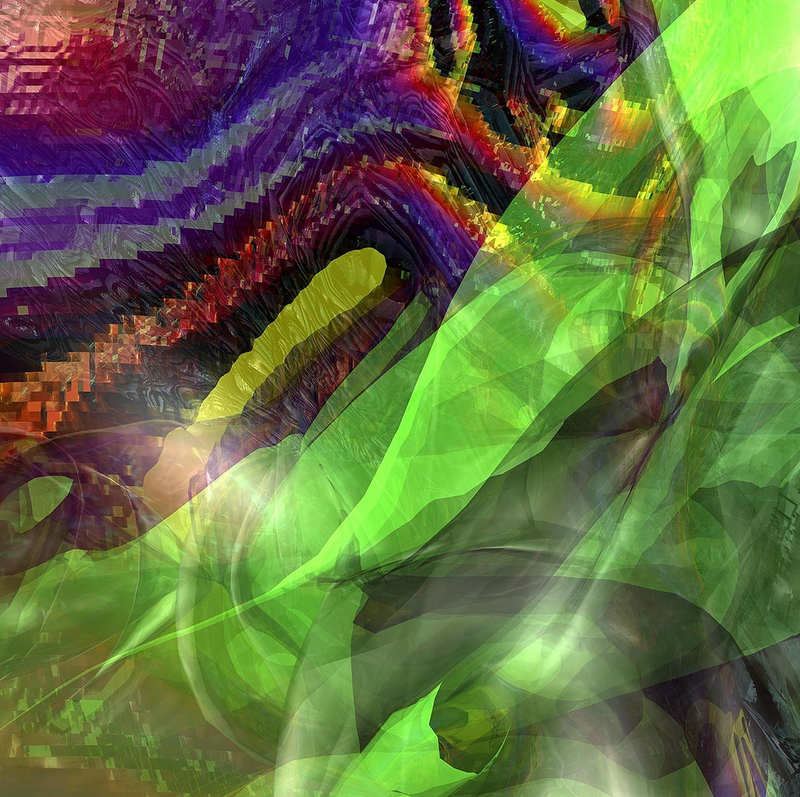 I started playing with digital tools shortly after starting graduate school at Ohio University in 2010. For the first batch of work, I created ceramic objects onto which I projected a digital surface. That work morphed into larger installation pieces. I can honestly say I had no interest in working this way prior to graduate school, but I deliberately chose a graduate program that was concept driven rather than anchored in a specific material in order to have more flexibility with my work. I started playing with space as a material due in large part to the spacious critique rooms available for installation-based projects and a desire to work on a larger scale.. The balance of digital and tactile is still a struggle. Because I’m interested in working on a landscape-sized scale, I’m always searching for something that feels substantial or big in the work. Sometimes that manifests as nine thousand wooden dowels with pinched clay on the end as in Once a Day or as a large projected live video feed as in Untitled, OH. #7. OPP: The images titled In Other Fields appear to be documentation of installations (based on how the media is designated), but they are quite evocative as photographs? Can you explain this work for those of us who have only encountered it online? KT: While I was working on large installation pieces in graduate school, I became interested in the documentation images I was making to record the work. Those documentation images morphed into creating staged images. The first few from 2013 were both documentation images as well as specific installations designed to be photographed. They were a way to work through ideas. 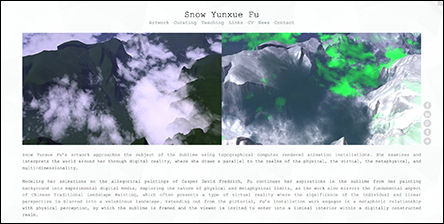 These projects allowed me to interact with a site as an installation and to create images of that interaction that could stand alone as independent works themselves. Since 2014, I have been creating images that are solely shown as backlit digital prints. I am attempting to do the same things with these prints as with my larger installations. 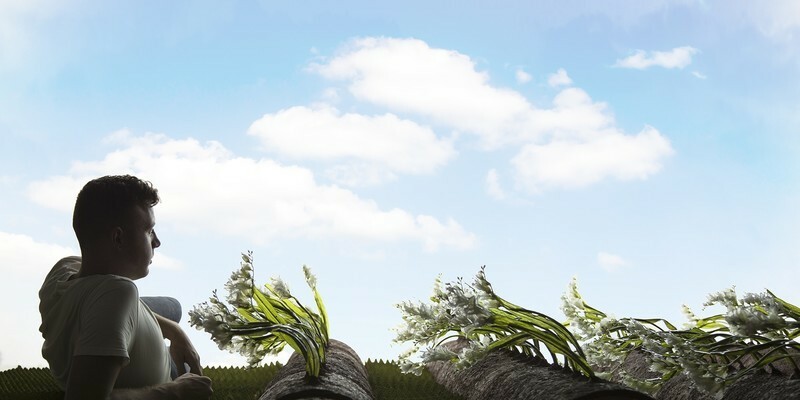 The digital images portray a built environment with handmade ceramic components. Conceptually, I am interested in presenting a moment of contemplation and longing while also presenting a window in the image leading to a different place, such as an in Tulpomanie. OPP: Fields are visual staples in your work. They show up as video projections and as ceramics. Once a Day (2015) and Untitled, OH. #8 (2013) are examples. I'd like to hear your thoughts on fields, both how you use them in your work and how you experience them in your life. KT: I grew up in western South Dakota: fields and open spaces are very much ingrained in me. I don't know that fields really specifically registered with me when I was younger, but I remember feeling literally and figuratively a long way away from a lot of things. Beyond that, a field is a single space, demarcated by use or purpose. A field is a place. I think about place as defined by three elements. First, a specific location is needed: a here and there. The second is a locale, the material setting in which social relationships take place: a wall, a road, a field. The final element is “a sense of place,” the subjective and emotional attachment a person or groups of people have to a place. This final requirement begins to function conceptually rather than as a social or graphic reality. As an artist I am interested in ways that I could construct and provoke this subjective and emotional attachment in a viewer. . . or at the least a sense of familiarity or distinctiveness. A field is a tract of land, which makes me think about distance and time. A field as an image tends to look like everywhere and nowhere simultaneously. The work that is titled In Other Fields is in large part about longing or yearning to be some other place, be it in time or space. Each piece in the series presents a figure in a given place interacting with an image of someplace else. The constructed objects that make up the piece are, much like the installations, again this attempt to recreate nature or another place. OPP: What are you working on right now? What's on the horizon? KT: I’ve just finished up a busy run of exhibitions. I had a solo show at the Yeiser Art Center in Paducah, Kentucky where I was able to put up a new installation. 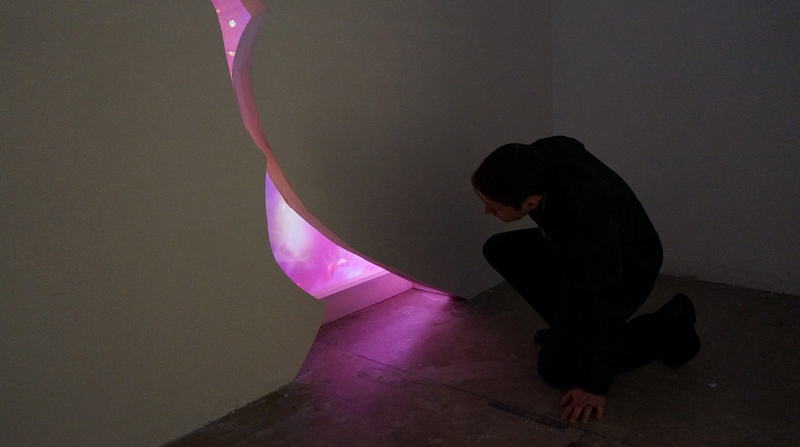 The piece was a companion to the installations Once a Day that I did last year. 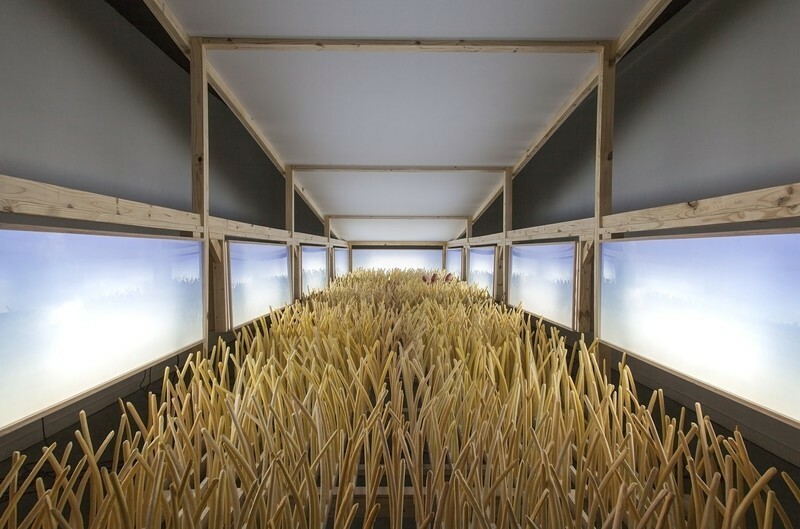 The new piece, titled False River, employed a similar structure as the one used in Once a Day to divide the gallery rather than fill the space completely. False River is a very long and narrow lake in South Louisiana that was once part of the Mississippi River and that has since been cut off. The name caught my attention because it describes something by what it is not, but there’s also irony behind it. It’s interesting to live in a state that has a very unique relationship between land and water. Nothing is solid, and it feels like there is water everywhere. I teach full time at Louisiana Tech University, so summer break brings welcomed studio time. This summer I will be heading to Bechyne, Czech Republic for an international ceramic symposium in July. I am currently researching different milling methods using a CNC router setup on ceramic surfaces as a way of potential manufacture. This could open up some avenues for creating more complex pieces. Teaching at a university with a strong architecture program has also got me thinking about different ways that my work can become more public by incorporating it into interior design. 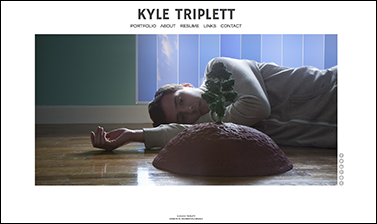 To see more of Kyle's work, please visit kyletriplett.com. JAVIER CARMONA’s photographs read like stills from motion pictures, hinting at the process of their own production. He directs and performs with actors in scripted scenes in rented apartments in far-away countries. 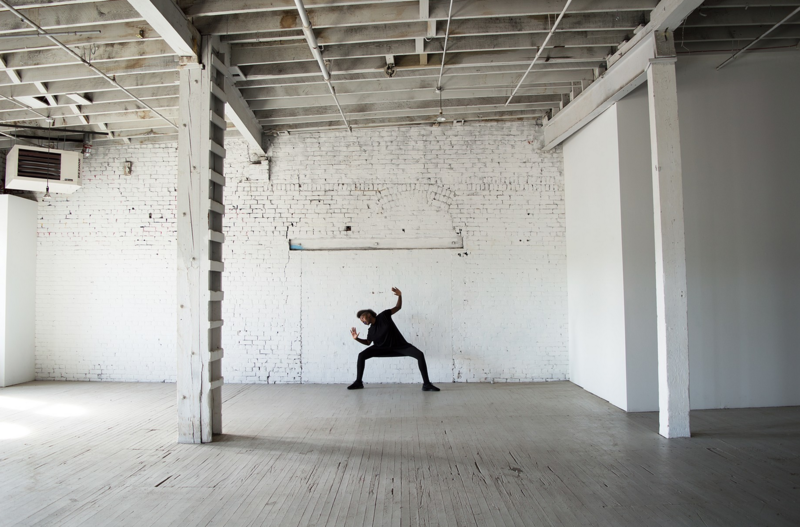 In recent projects, he performs the character of Xavier, whose navigation of romantic relationships is an exploration of language, gesture and intimacy, both between humans and in relation to the cultural specificity of geographic locations. 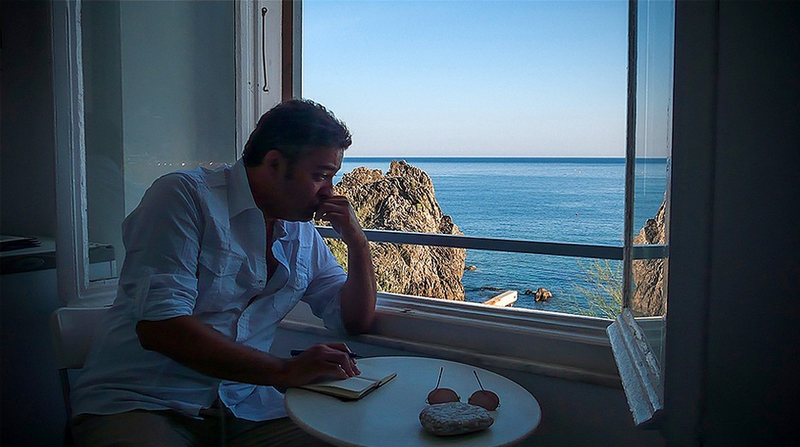 Javier earned his BFA from The School of The Art Institute of Chicago in 1994 and his MFA in Photography from The University of New Mexico in 1997. 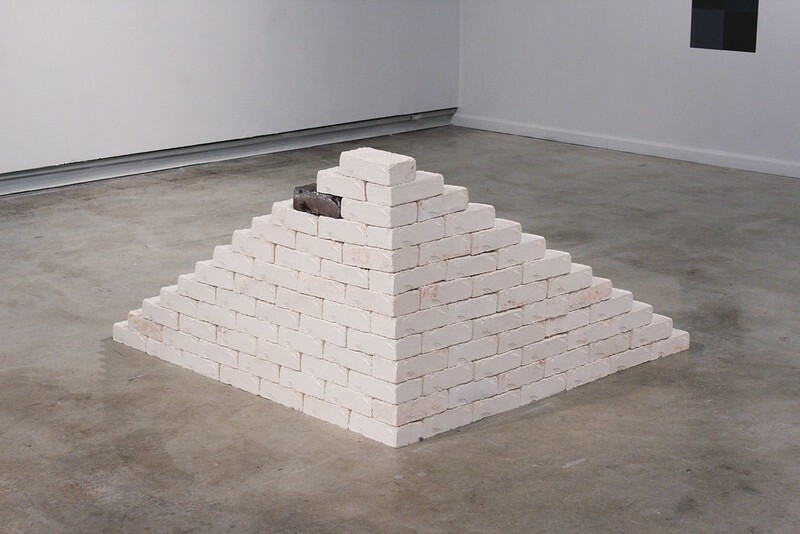 He has exhibited extensively throughout the United States, Mexico and Italy, and his work was most recently seen in Front and Center, the culminating show for the Center Program Residency at Hyde Park Art Center. In 2016, Javier will have solo exhibitions at Galería de Arte Contemporáneo, Secretaría de la Economía in Mexico City and The Photo-Four Gallery at South Suburban College in South Holland, Illinois. In March 2016, he will present Making a Scene: Towards an Actor’s Method for Still Photography at the National Conference of the Society for Photographic Education. Javier teaches at Dominican University in River Forest, Illinois and lives in Chicago. OtherPeoplesPixels: Could you expand on your notion of an "epic picture?" Javier Carmona: It’s my reaction to the limitations placed on photographs by defining them as categories. There’s a part of me that loathes talking about pictures in terms of portrait, still life, landscape. Curators seem insistent on cataloging an image as a way of assigning its meaning. I don’t know how to answer the question, “Are these portraits?” I can’t bring myself to teach that way. I don’t get it. I’d rather address the picture as a temporal phenomenon; an epic picture negotiates a narrative not bound by time. The still photograph is decontextualized time, even though we think of it as originating from a linear sensation of it. I anchor the still picture in a dialogue with the moving image. In cinema, the methodology of fusing the external world with the rehearsed intentions of a performed action is so much more of an accepted circumstance. My work brings that audience expectation of cinema to the still photograph. Years ago, in my dissertation, I paraphrased Brecht’s idea of the Epic Theatre and began using the phrase Epic Photography; the epic picture is one which looks for a renewed, human expression of the actual and resistant world. In this sense, our phones take pictures, but they’re often obstacles to our tangible surroundings. I’ll take the sensual and the social over the virtual. But let me be clear: it is possible to make an epic picture with a cell phone. Epic is not about scale or file size. I'm for any device that engenders contact with the external place. I'm more critical of our self-hypnosis with gadgets; our debilitated social behavior because of them. My principle camera these days is my Samsung Galaxy Note. It's the biggest cell phone they make, but still discreet. It makes the initial mark, like location scouting." OPP: Are your characters archetypes or individuals? JC: The key word is character. Even when I perform in front of the camera, I play someone named Xavier. That simple letter change—from Xavier to Javier—allows me a conceptual distance. I can embrace an affectation other than my own. So many of the recent projects, like In the Arena, have started with scripts in which the actors play characters. I’ve noticed my impulse to give them X names: Xoraida, Xenobia, Ximena, Xan, Xochitl. The X finds variable pronunciation; perhaps an extension of a mutable identity. It’s the mathematical unknown. It serves to exoticize these characters for an audience. Perhaps the characters approach the archetypes of audience expectation—an ethnically ambiguous visage we could call Latin. OPP: As the viewer, I feel a sense of longing that I also read in the characters. I'm longing for the rest of the story—all the parts between the captured moments. . . the moments I don't get to see—and they seem to be longing for connection or belonging. I am drawn in by the intimacy and vulnerability in the images themselves. What roles do intimacy and vulnerability play in the process of making the images? JC: I tell myself to make straight forward pictures about what I don’t understand. That requires risk and yes, I hope, emotional vulnerability. I want the characters to examine what they don’t know about each other and the circumstances of their surroundings. The scenarios are largely written that way. It’s important the characters suddenly realize they are not where they once were, that they’re on an indifferent street in Mexico City or an arresting intersection in Rome. I had a long habit of going to Mexico to photograph, but a handful of years ago, I began renting furnished apartments to extend my stay there as long as it was sustainable. I wanted to have a resident’s intimate knowledge of the place I had been born, but only knew in brief, albeit regular intervals throughout my life. Even before I knew to articulate it, I longed to create a cinematic illusion of what that other reality might be. So the Xavier character emerged as one negotiating a romantic relationship. The series, Mexican Cinema evolved into something I called The Enamorates / Los Enamorados. I thought of Xavier’s female foils as extensions of this intimate knowledge. To know Ximena, was to broach the immediate circumstance. Do the female characters become embodiments of ideals? Maybe initially, but only as a starting point. Love Streams-an Italian Play, my ongoing work in Italy, initially came from an opportunity to teach in Florence during the summer. There emerged a parallel search for this intimacy you’re perceiving. In this case, it was a culture that resembled my own, but different enough to pose the obstacle of language toward understanding. I liked the prospect of being a chameleon there, of being mistaken for an Italian. On the streets, I would be asked for directions as if I were a resident; inevitably this informed the Xavier character. In Italian there is no letter J. So it was easier to be Xavier. 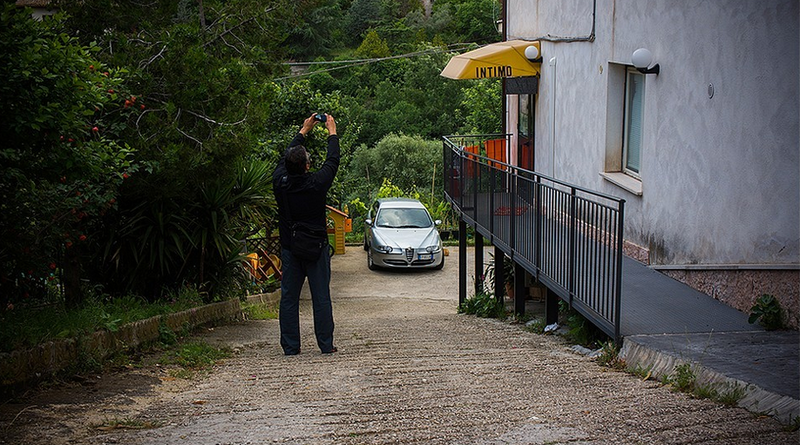 In Italy, I really began to think mostly in gestures and physical actions. I am still hoping to get that idea right: how two people might learn to negotiate emotion, despite communication. The in-between moments you describe are the ones in which I think photography works best—when it resists explanation and revels in ambiguity. There’s more to be learned by ambiguity than a straightforward recitation. While I have been shooting these scripted scenarios to eventually also be a proper short film, I fear the ambiguity of the still may be lost once the image begins to move and explain itself. JC: I'm often told, "These photographs should be films," implying this narrative speculation is not the purview of the still. I disagree. That longing you're describing, is much more indelible in a still that isn't replaced by the next moving frame. Photographs resist explanation as much as the external world resists providing the answers. 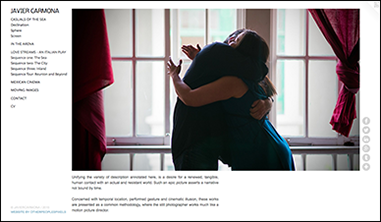 But ultimately the "resistant world" deposits the rehearsed gesture "on location," inviting an interaction with elements out of one's control, making credible what is enacted in the process. It's what I see in Cassavetes or French New Wave films made on streets, without permission and probably why they were my central influences. OPP: You occasionally use subtitles, sometimes in English and sometimes in Spanish. Where does the text come from? Do you think about audience when deciding which language to use? JC: The text is pulled directly from the scripted scenes. The sequence of stills which make up In the Arena, highlights the physical gestures being performed. In the film version I’m editing, I’ll likely have the entire narrative subtitled regardless. Very likely the text will fluctuate in language and waiver in the accuracy of its translation. It would become a second dialogue over the spoken one. I don’t mind that the subtitles or even the titles for the images go untranslated for what is initially an English-speaking audience. If they’re interested, they’ll use the universal translator on their phones. Otherwise, it’s another layer of ambiguity. Is it mischievous to give untranslated Spanish or Italian titles to works seen mostly by an American audience? Hopefully it makes them self-conscious of their role as an audience. To me it broadens the definition of what should be a mainstream experience of art viewing. It’s asking the audience to consider more information as part of who they are. OPP: Language and translation is just one part of comprehending work that bridges multiple cultures. You've exhibited throughout the United States and extensively in Mexico City. Is your work understood differently in Mexico versus the U.S.? JC: Is the work understood differently in Mexico? Oh gods, yes! And that’s so refreshing. Having those actual conversations with different audiences is the heart of the dialogue the work is looking to engage. As if the work itself provides the pretext to interact socially with people I’d like to know further. Despite my Mexican birth or fluency in Spanish, Mexicans regard me as an American artist, with the accompanying exoticism. I’m intrigued by how I’m perceived in these different places. It feeds the character. When I started going there as a young artist, gaining social acceptance in my country of origin was an unspoken motivation; exhibiting work was a way to do that. Now I go find a community I miss enormously. In the States, many art people go straight to gender in this work and are often unwilling to allow me the conceit of playing a fictional character. I showed Mexican Cinema to a book publisher, who felt the work was mostly about surrounding myself with beautiful women and dismissed it outright. I’m still baffled by that. I couldn’t get her to engage with the importance of location in the evolving narrative. Was she culturally intolerant or offended by a perceived sexism? I tend to not have the work explain all these references, for fear of becoming didactic. Ambiguity is king. But it comes at a cost when the audience isn’t aware of the cultural baggage you’ve arrived with. I exhibited a few stills from In the Arena in Mexico City recently. They got it. They were eager to have a conversation about the telenovela and how it affects the Mexican expression of emotion. There’s an acting school in Mexico City that teaches a melodrama class called Bofetada y Lagrima, which focuses on the slap and crying for the camera. I think a discussion of that in an American context would be extraordinary. OPP: What about specific geographical references that American audiences might not get, such as the Paseo de la Reforma in Mexico City? How does this location add another layer of meaning in The Reforma Rehearsals, Part I and II (2013)? JC: The Paseo de la Reforma is Mexico City’s principle artery. It’s one of the busiest—maybe ten lanes in some stretches—stitching together the many monuments of the city’s identity. To have a film, where an actor, walks as slowly as possible in real time against the current of the fastest traffic, is akin to reclaiming an individual presence in this vast city. It takes her nearly 15 minutes to cross 50 feet in the volatile context of chance occurrence. That’s epic, as I’d like to think of it; the gesture is not bound by time. OPP: I initially read your work more literally as about intimacy and vulnerability, gender roles and possibly archetypes from the telenovela, which I had an inkling about, but didn’t feel well-versed enough to comment on. I was particularly curious about the vulnerability of the Masculine. But now, I see the romance as an allegory for cultural and geographic belonging. 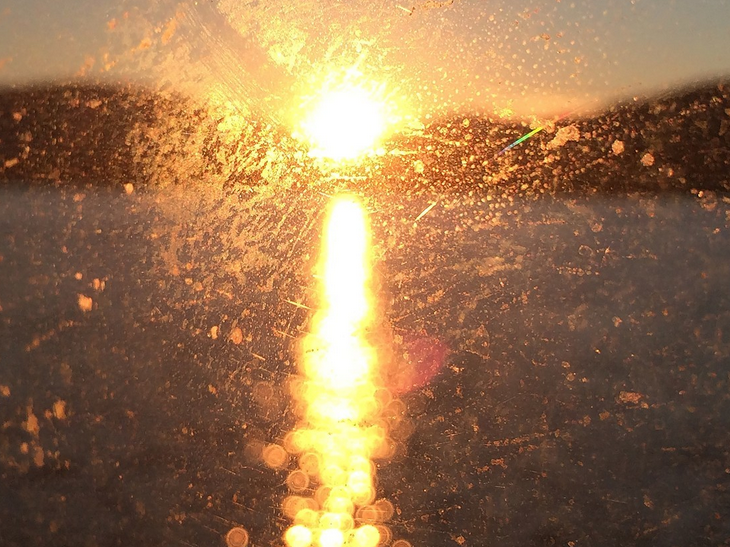 What I initially thought of as a longing for human connection, I now see as a more general longing for belonging. Thoughts? JC: Belonging? That works. . . You know, you're reminding me that I've rarely felt comfortable in a room full of people where everybody looks and sounds the same. I've always felt more at ease in heterogeneous surroundings. And that alien feeling happens in Mexico, too. At the same time, I've had an instinct to understand by infiltration. My interest in language and gesture allows me to be a chameleon. Making pictures and now studying acting exists in this context. I loved that I've been confused for an Italian or someone of Middle Eastern descent. It sets up the challenge to find a way to belong. To learn how they greet or love. To see more of Javier's work, please visit javiercarmona.com. Featured Artist Interviews are conducted by Chicago-based, interdisciplinary artist Stacia Yeapanis. 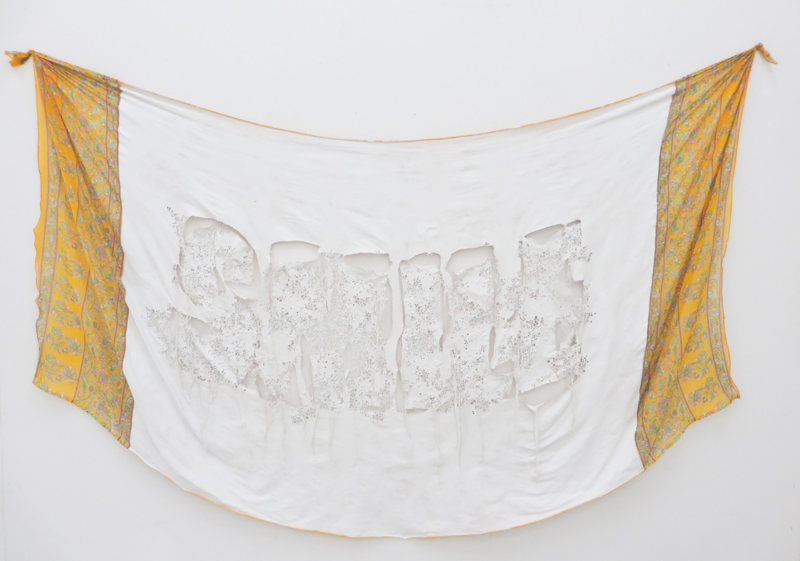 When she’s not writing for OPP, Stacia explores the relationship between repetition, desire and impermanence in cross-stitch embroideries, remix video, collage and impermanent installations. 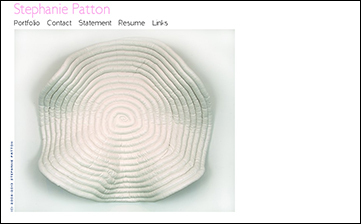 She is an instructor in the Department of Fiber and Material Studies at The School of the Art Institute of Chicago, where received her MFA in 2006, and was a 2012-2013 Mentor-in-Residence at BOLT in Chicago. Her solo exhibitions include I Still Haven’t Found What I’m Looking For (2013) at Klemm Gallery, Siena Heights University (Adrian, Michigan), Everything You Need is Already Here (2014) at Heaven Gallery (Chicago) and When Things Fall Apart, a durational, collage installation in the Annex Gallery at Lillstreet Art Center (Chicago). 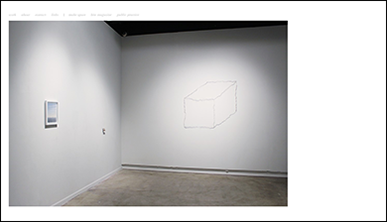 Form Unbound, a two-person show, also featuring the work of Aimée Beaubien, runs through December 19, 2015 at Dominican University's O’Connor Art Gallery (River Forest, IL). 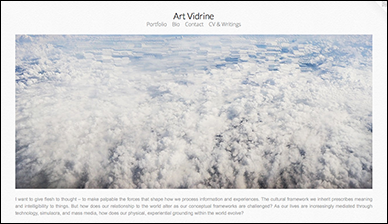 Interdisciplinary artist ART VIDRINE is concerned with how we perceive the surrounding world and how our literal and metaphoric lenses affect the meanings we make. In photography, collage, sculpture and video, he modifies and destabilizes our existing cultural frameworks, calling into question individual agency through abstraction. Art earned his BA in Comparative Literature from the University of North Carolina (Chapel Hill) in 2002, and went on to earn his MFA in Fine Art from the School of Visual Arts (New York) in 2014. He was curated into Miami Projects in 2014. In 2015, his work has been included in Battle of the Masters at Open Gallery Space in New York and Plus One at Sideshow Gallery in Brooklyn, and in January 2016, will be included in Abstract Preferences at NIAD Art Center in Richmond, California. He is a participating panelist on an upcoming episode for TransBorder Art titled Discomfort, which will appear on public television (tentatively in December). Art is a contributing writer for ArtSlant and lives in Brooklyn. OtherPeoplesPixels: How did your undergraduate degree in Comparative Literature set the stage for your photography, sculpture and video work? Art Vidrine: Before the degree, there was a love of literature, which was rooted in early childhood, much earlier than any affinity for visual art. From adolescence, I was attracted to what creative intelligence has to offer in making sense of the world: empathy, reflection and imagination. I mention this because no matter how driven by abstract ideas my art may be at times or how rationally I discuss it afterwards, my work still draws heavily from those human qualities I find in literature. Comparative Literature allowed me to explore multiple languages (and consequently multiple perspectives) and lots of theory. Undoubtedly, my obsession with certain themes was formalized in college, especially with that hobbyhorse of reader-response theories: audience agency. box - 48" x 48" x 48", carpet - 72" x 96"
OPP: Do you think there is a difference between textual thinking and visual thinking, from a process point of view? AV: Yes and no. At their best, both textual and visual thinking defy conventional thought and form. The origin of that creative impetus is the same (an attitude), and the process is similar (channel that attitude into a communicable form). That being said, there is definitely a difference between the two, which manifests itself most acutely when talking about work with other artists. Some can ascend the heavens with a brushstroke or click of the shutter, and yet their tongues can barely get them off the ground. Textual and visual thinking are somewhat different skill sets with different vocabularies and differing dependencies on concepts. Both can be strengthened, but only up to a certain point. After that, talent and desire take over. Parenthetically, I do think some artists read and relate to work differently than others. Some of my friends are painters for whom the brushiest brushstroke or the richest hue is like a conversation with God. They are transported in ways that I will never be in relationship to painting. They look for different things in those works than I do. Conversely, the cleverest conceptual project can send chills down my spine and leave them feeling cheated of a meaningful experience. If the difference is just a matter of picking up on nuances in the work (i.e. references, interesting decisions made when making the work, etc), then that is something that can be rectified over time with more exposure to art. OPP: Could you talk about the categories— Agency, Perception, Abstraction and Surroundings—you use to organize the work on your website? AV: These days, the art world prefers artists to have a “thing” – an identifiable, readily digestible and marketable focus, a singular purpose that can fit nicely into an elevator pitch embodied in press releases and talking points with board members and collectors. There is certainly value in sustaining a tunnel vision commitment to one thing in depth, whether it be a process or topic. But my interests do not coalesce so easily. In fact, the topics themselves that interest me do not play well with reductive boundaries, opting instead for cross-pollination. Abstraction, perception, and agency are interdependent. I elaborated on this in my graduate thesis, which anyone can read from my CV & Writings section if they need something to help them fall asleep at night. Honestly, the categories on my website are really meant to make the constant themes that I return to more apparent for those who do not know me or my work. I see the thread, the relationships amongst the different media, forms, and subjects. That thread consists of three intertwined topics: Abstraction, Perception, and Agency. Work in one category could also exist comfortably in another. The choice of which work belonged where had a lot to do with what I saw as the predominate concern of each work. Surroundings exists as a category for sharing my love for landscape and cityscape photography, which often have a hard time fitting into one of the other three categories. One’s environment unequivocally shapes how he or she experiences the three topics mentioned above. Sometimes, it’s hard to classify how. OPP: What role do lenses, filters and screens play in your practice, literally and/or figuratively? AV: The lens (mental and physical) with which we view the world is directly related to the three main themes my work addresses. I do not set out to emphasize lenses, filters, and screens as a material. That happens naturally as a result of my chosen themes. They are merely the metaphorical conduit for a reflection on perception, and consequently perception’s influence on agency. OPP: What was your process for creating Performative Utterances: A Symphony (2015), in which you translate political rhetoric into music? Why did you choose the particular speech that you chose? AV: I transformed Netanyahu’s voice into MIDI notes, multiplied those notes into different layers, and then assigned each layer a software instrument. I tweaked some notes—shifting octaves, changing a couple to a different note and extending the duration for some—but mostly kept them untouched. I adjusted the parameters for the instruments to achieve the sounds I wanted and gradually added in or removed instruments as the performance progresses. Who knew Netanyahu was so musically talented? I chose this speech because of the theatrical nature of the spectacle. This is not to say that Netanyahu’s speech was not good or relevant. He has some legitimate concerns. It’s just that the whole event felt like a night at the symphony or a rock concert, with adulating fans roaring, sea swells of standing ovations, a maestro’s swagger. There is even the analogous handshake with the first chair, the singer’s wipe of the mouth between songs. It made me wonder how much of the speech’s political content could be conveyed even without words, which then made me think about the long history of the relationship between music (the most abstract art form) and politics. This was as much about abstracting political content from speech to sound as it was about discovering a new way to build a symphony. I’m sure classically trained musicians will disagree with the distinction of this work as “a symphony,” “classical,” or even “music.” But I think it functions quite well as a kind of avant-garde symphony. Netanyahu was trumpeting an aggressive, antagonistic position, so I gave him (literally) the brass his speech (figuratively) conveyed. OPP: In your artist statement you say, "The cultural framework we inherit prescribes meaning and intelligibility to things." Then you ask, "But how does our relationship to the world alter as our conceptual frameworks are challenged? As our lives are increasingly mediated through technology, simulacra, and mass media, how does our physical, experiential grounding within the world evolve?" These seem to be the long-term questions of your practice. I'm wondering if you have any answers, or at least theories, yet? AV: Hmmm. . . If I did, I don’t think I would need to make art anymore. To see more of Art's work, please visit artvidrine.com. Subtlety is a strategy in JASON JUDD's photographs, videos and sculptural arrangements. Using the contemplative space of the white cube as a context, his quiet gestures revolve around the "boring, infuriating, troublesome" experience of a natural, human longing to stop life from moving, to hold on to this moment, even as it passes away. 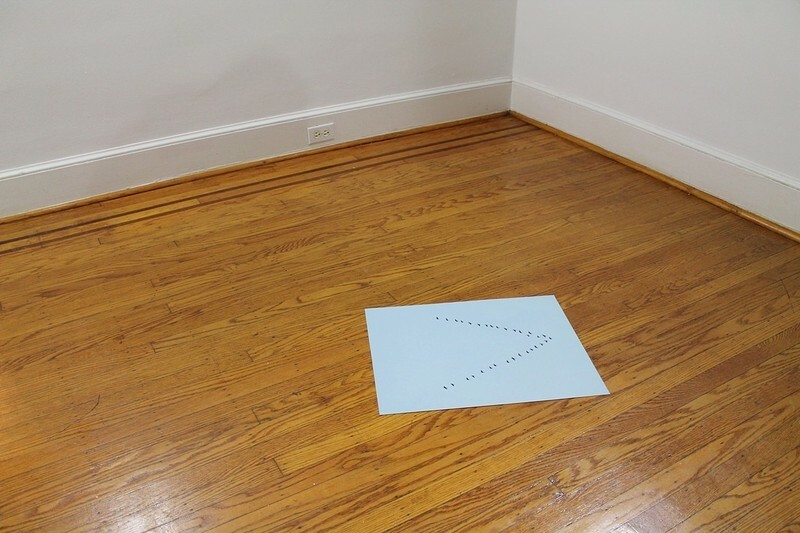 In 2013, Jason had three solo exhibitions: Adjustments: One Through Five at Open Gallery (Nasvhille), Essays in Navigation, Baltimore at Lease Agreement (Baltimore) and Example: Compass Deviations at Gallery 215 (DeKalb, Illinois). Jason is a Co-Director of the Chicago-based art and contemporary practices website Make-Space.net and Art Editor for BITE Magazine. 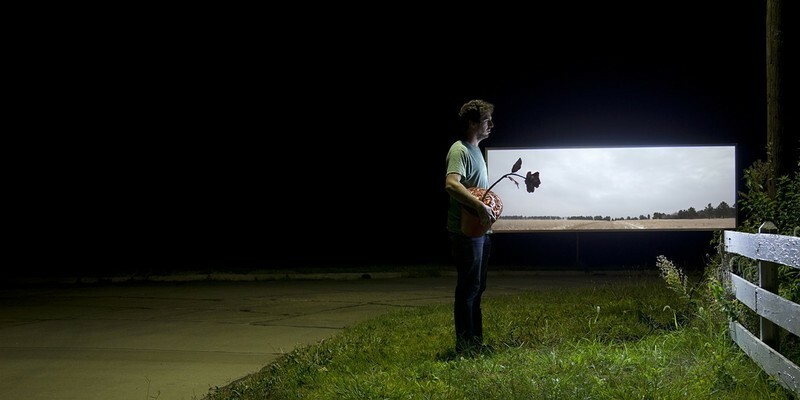 Along with artist Iga Puchalska, he has recently launched Public Practice, an new initiative aimed at expanding engaging art programming in Rockford, Illinois, where Jason lives and works. OtherPeoplesPixels: Could talk about framing nature inside the gallery in works like Shooting Star, Horizon Series and True North? Are these works about the sublime? Jason Judd: I think my work is more about the finite world than the sublime. I have read a lot on the sublime and existentialism, only to find myself knowing nothing more about it. We have many experiences in our lifetime: the sublime is probably not one of them. I am looking at the limitations of our everyday. They are boring, infuriating, troublesome and can provide a different kind of poetics than speculation of the grand. A Roland Barthes quote in Camera Lucida has always resonated with me: “I was like that friend who turned to Photography only because it allowed him to photograph his son.” I find myself, as an artist, in the role of that friend—sharing a desperation and urgency to capture something—the metaphor of the son is, at the same time, growing closer and farther away from us. I am not skilled enough in any particular medium to make something that is “beautiful”—by beautiful, I mean capturing the essence of the subject through heightened skill of a medium—nor am I interested in being skilled. Like the friend, my skill is born only out of necessity. The gallery is one of the few places where technical skill is not a requisite factor for judgment of quality. And yes, quality is a strange word to use while describing a sense of de-skilling of an object. But the conventions of the gallery offer a contemplative space where quality is malleable and the viewer is asked to participate. It is a place where I can say, I have personally spent some time with these images or objects, and these are the conclusions I have come to. OPP: You've used yourself and your family members as a subjects in several video works like Genesis (a haunting) (2012), Acts of Consciousness and Other Longings (2011) and Into the Son (2012), all of which emphasize the familial. More recent works involving sculpture, installation and photography center around experiences of nature in the gallery. What led to the shift in focus and means? How are these works more connected than might be assumed upon first glance? JJ: Both bodies of work are based on the tension between longing and the tangible. In other words, what does longing look like? The videos involving me and my family were becoming very theatrical. I decided I did not want to personify my metaphor. I wanted the medium to be just as important in the metaphor as the subject and the subject not to be overtly autobiographical. If there were to be any theatrics in the new body of work, I wanted it to be made in the gallery. In Horizon Series, for example, I confront the space where the mountains meet the sky as metaphor for longing. I force the horizon line to be tangible by cutting it out of the large photograph. The image and medium become one entity. The image dictates the shape of the thin cuts, and the cut line reveals the tangibility of an otherwise romanticized and unattainable visual cue. With these cut pieces, I make physical and abstract decisions about how to deal with them as objects. When they are installed around the gallery, the scale is initially obscured. 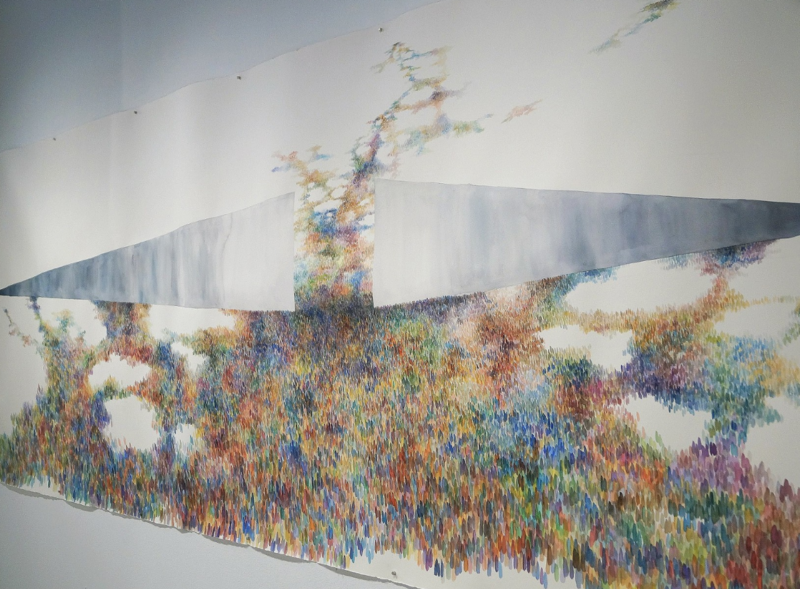 At first, the viewer experiences the line forming the cube at a one-to-one scale. Upon closer investigation, the immensity of what the thin line represents is revealed. The act of forming a cube with the lines is a physical manifestation of the idea of a three-dimensional illusion. The horizon line is actually something we can experience and understand only in the abstract, just as we experience a drawn cube. OPP: You have your hands in a lot of pots. Aside from being a maker, you work at the Rockford Art Museum in Rockford, Illinois, you are Co-Director of and a regular contributor to Make-Space.net, as well as Art Editor for BITE Magazine. How do you balance so many different roles? JJ: Balancing all these roles can be time consuming, but they allow me to maintain a productive and creative frame of mind. They keep me thinking rigorously and critically. Collaboration acts as motivation—others are depending on you as much as you are depending on them. It takes a lot of mutual respect, patience and vision to sustain a productive collaboration. My other two co-directors from Make Space, Etta Sandry and Lynnette Miranda, are two of the hardest working people I know. I can truly say that I look up to both of them in many different ways. 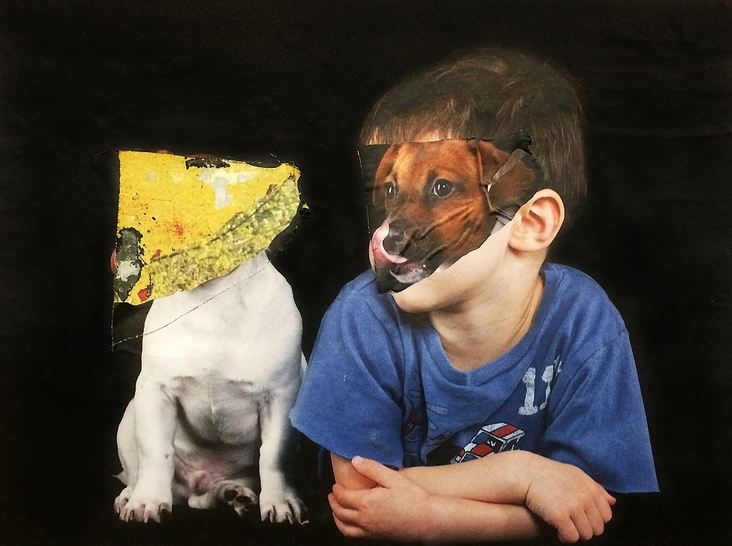 BITE is a great experimental, online collaboration because I have never met my Features Editor, Daniel Griffiths—or any of the other editors, for that matter. They live across the globe, spanning New York, London and Singapore. The Rockford Art Museum is a comfortable place for me because it is a collaborative atmosphere with passionate people. Everyone at the museum has welcomed my ideas, skills and experience that have came from these other roles. But how do I really balance all of these roles? Barely. OPP: And how do these other roles relate to or inform your studio practice? JJ: I have thought about the relationship between the projects I am involved in and my studio practice many times. Sometimes I throw up my hands in frustration and say, “I guess all of it is my practice!” But that’s not true. That is too easy—it is a simple way to avoid being critical about my interests and myself as a person. Honestly, I believe the most important aspect of the relationship between the roles and my studio practice is the tension and flux. The very thing that inspires me is the thing that keeps me away from the studio. Visiting other artists’ studios is wonderful. Afterwards, I feel like I not only understand the artists’ work on a personal level, but it also reveals a strength or weakness in my own work. That fact is, I have learned more about what art is and what making means through conversations, interviews and studio visits than I ever have in academia. OPP: What’s your favorite piece of your own work? JJ: I think Boat, Bird, Now is my favorite piece, probably because it is still fresh to me. It tackles a lot of the same issues that Horizon Series does, but in a more compact, poetic way. 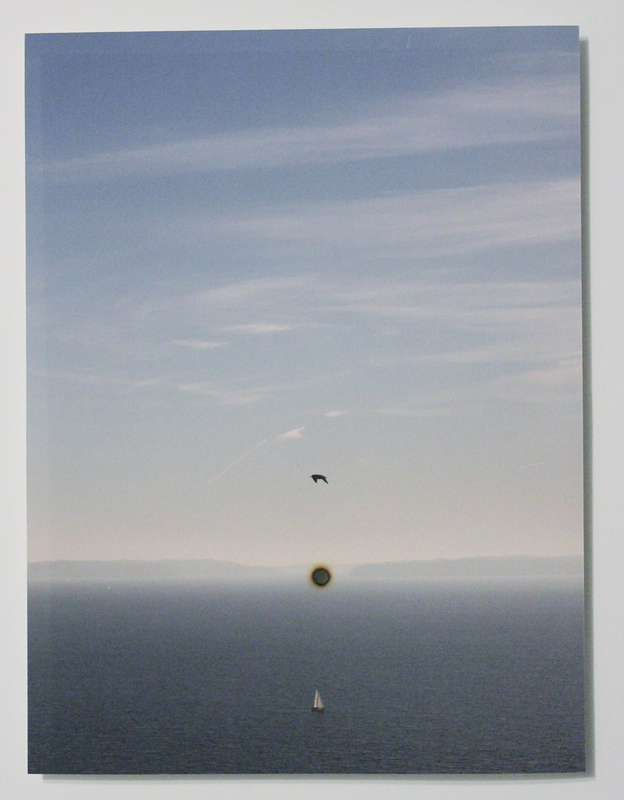 The cigarette burn forces a connection between the boat and the bird while intersecting the horizon line. I am trying to control a beautiful image or moment in a physical way, or trying to relate to a moment that has passed but has been captured. OPP: You've also recently launched a new initiative called Public Practice. What's your mission? JJ: My wife Iga Puchalska and I moved to Rockford in July 2013. We immediately saw a need for more contemporary art and programming. Rockford is pigeonholed as one of the most “dangerous” or “miserable” cities in America, but it is gaining a lot of energy from creative people who are starting from the ground up. Public Practice is not a physical site; rather it is a collection of culturally relevant, interdisciplinary projects. Our mission is to provide smart, engaging, challenging art programming to the Rockford community and beyond. These projects materialize through the collaboration between Public Practice and other organizations, spaces, businesses and artists. 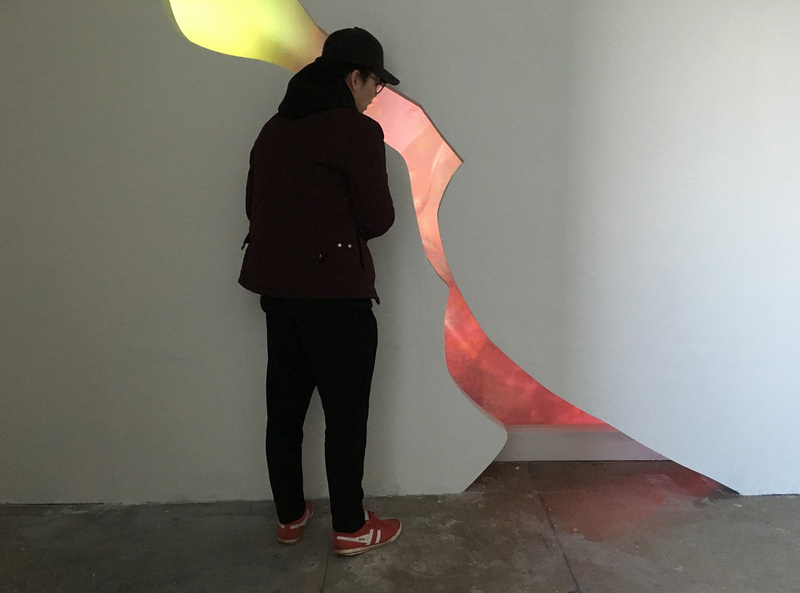 Each collaborator utilizes its own strengths and resources to formulate a project that is aimed at exposing the public to contemporary art with the goal of developing new social perspectives while expanding dialog between Rockford’s community and contemporary art practices. We aim to be an educational entity, to the public as well as to the collaborators and ourselves. We invite the public to work with us, not as a means to an end, but in order to emphasize the practice of exchanging ideas through creative foundation. Iga and I are approaching Public Practice with a sense of sincerity, experimentation and resourcefulness. We are very excited because this project can have a very real impact on the community. OPP: Do you have any projects lined up yet? JJ: We just had our first successful project called Parade on June 13, 2014. In the spirit of collaboration and public engagement in the arts, we organized an art exhibition with artist Jesus Correa and Rockford Art Deli. We considered the parade as an art medium and the floats as art objects. Parade started in the public and invited the public to participate. Local and regional artists were invited to create "floats" to accompany them during the parade, which ended at an art exhibition at Rockford Art Deli. Along with the artists, the public was encouraged to join our sidewalk parade—which they did in great numbers! We had well over 100 people in the parade, representing the very diverse Rockford community. We hope to make this a yearly occurrence. 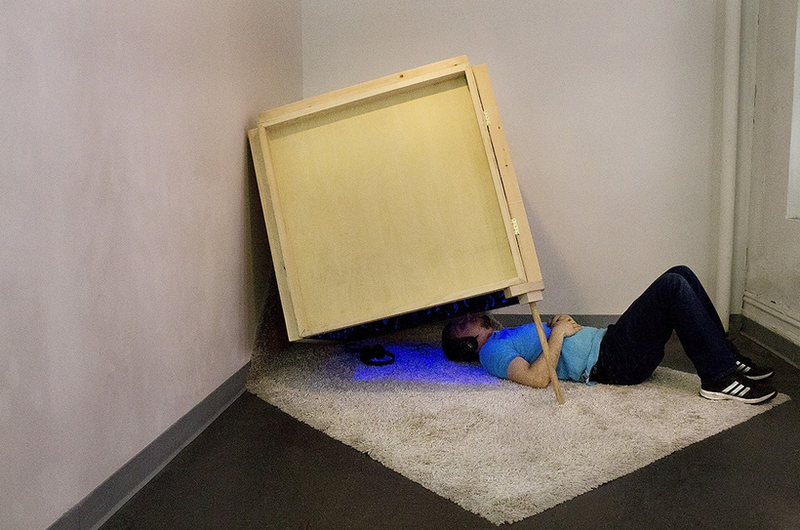 We are also teaming up with Conveyor, a space for live storytelling, to create a programming-heavy exhibition series. 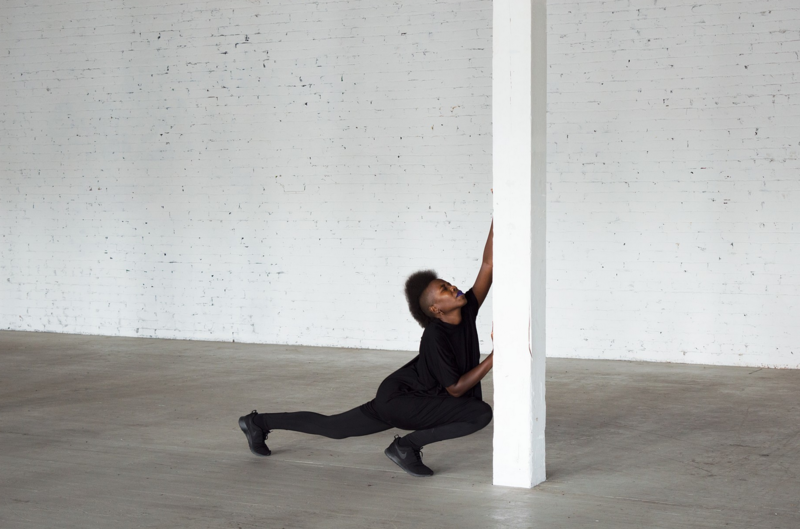 Because the aim of the project is to approach the artist’s practice as transparent, invited artists will be asked to create an alternative approach to programming. This programming will act as a springboard to demystify or intensify contexts within the work that is being exhibited. We are happy to have James T. Green as our first artist! To view more of Jason's work, please visit jasonajudd.com. 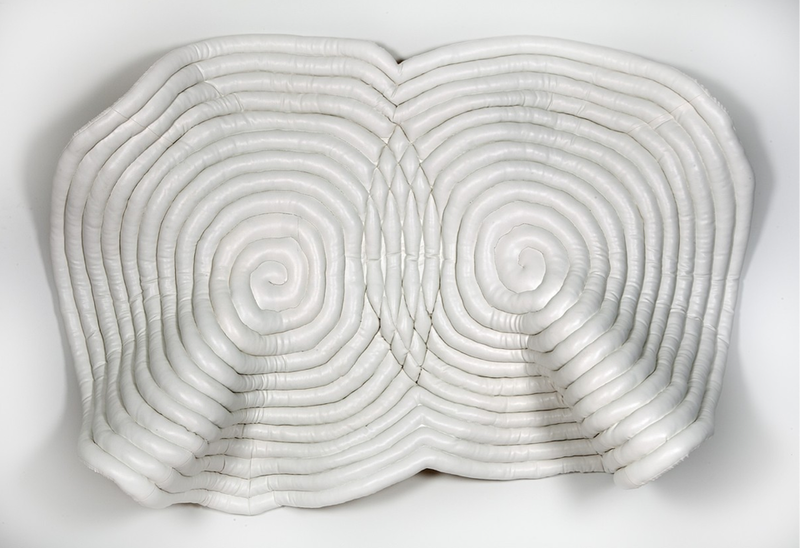 55" x 86" x 17"
Multimedia artist STEPHANIE PATTON uses humor, word play and an attention to materiality to address the universal human experiences of suffering, comfort and healing in her quilted sculptures, videos and installations. Stephanie is represented by Arthur Roger Gallery and is a member of the artist-run collective The Front, both in New Orleans. 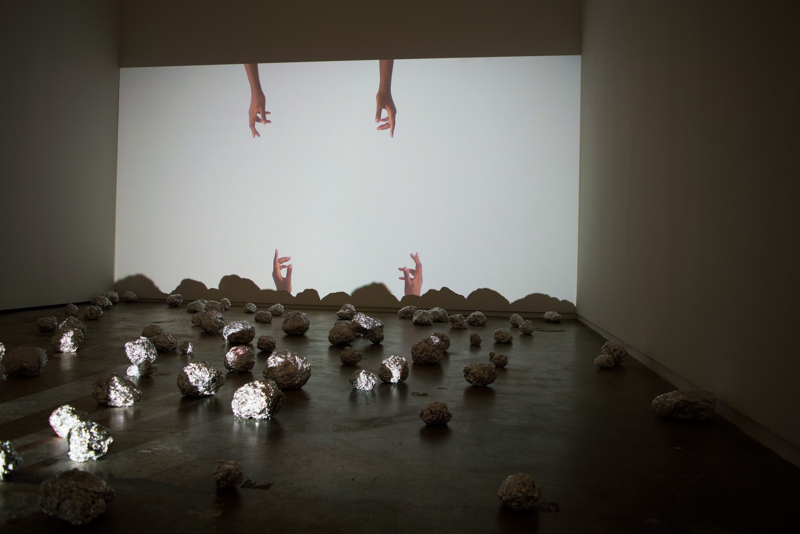 Her numerous solo exhibitions include Private Practice (2013) and Diffuse (2010) at Arthur Roger Gallery, as well as Upkeep (2012) and General Hospital (2011) at The Front. In 2013, her work was included in group exhibitions at the Frederick R. Weisman Museum of Art, Pepperdine University (Malibu, California), Biggin Gallery, Auburn University (Auburn, Alabama), Vox Populi (Philadelphia) and Acadiana Center for the Arts (Lafayette, Louisiana). Stephanie lives and works in Lafayette, Louisiana. OtherPeoplesPixels: Could you talk about the relationship between pain, healing and humor in your work? Stephanie Patton: Healing takes many forms, both physically and emotionally. Painful experiences can lead to creative expression and are often the impetus behind some of the most engaging work. What source material would a stand-up comedian have if it weren't for strange life experiences and painful moments? I believe the same is true for many visual artists, musicians and performers. There have been many instances in my own work when I was drawn to an idea, material or image for no particular reason. Then later the relevance became clear to me. One example is Life Saver. In 2006, while in residency at the Vermont Studio Center, I kept envisioning a grid-like pattern of multiple inner tubes covered in white vinyl lying on the floor. I wasn't quite sure why this image kept entering my mind. I later realized that this was in fact my own reaction to Hurricane Katrina and the devastation that it had caused here in Louisiana. This idea was not completely resolved until 2008, when I decided to suspend the inner tubes from the ceiling instead of placing them on the floor. Instead of white vinyl, I used mattress quilting—a material that I continue to use today—for the first time because of its multiple references. I have heard that an artist has one or two great ideas in a lifetime, and the core of my work is based on striving to empathize with and understand those afflicted with physical and mental health issues. Certainly, we are in a day and age in which mental health is a growing concern, and it is luckily not as taboo as it was in the past. I am particularly interested in how physical ailments often manifest as extreme stress and/or traumatic emotional states and vice versa. I strive to illustrate connections between physical and emotional states in my work. This is especially the case in the white vinyl pieces that I have made in recent years. 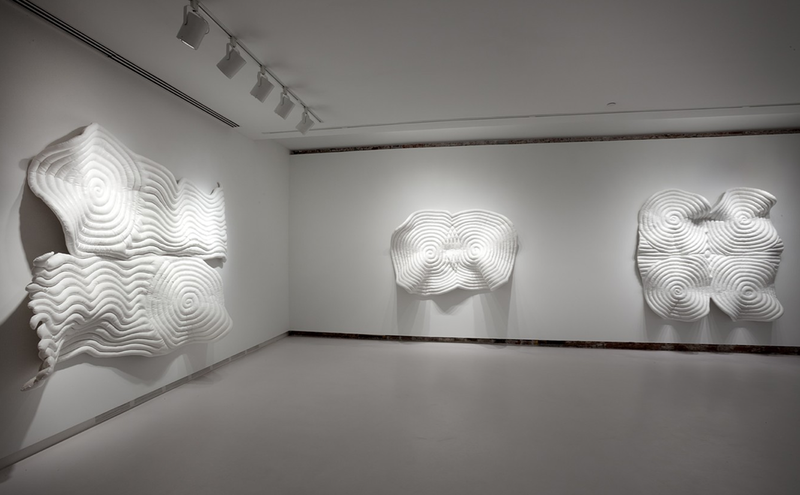 OPP: The patterns in pieces like Strength, Valor and Meeting in your 2013 exhibition Private Practice evoke the raked patterns in Zen gardens, and I see a connection between the handwork of quilting and the contemplative state associated with the Zen garden. Is this a visual reference for you? SP: Zen gardens were not a direct reference for me, but I see the visual and conceptual connection. In researching visual symbols relating to the emotions, I was very drawn to the Adinkra symbols of West Africa. These symbols are very simple, yet visually powerful and could easily translate into the material of vinyl that I continue to explore. The emotions they represent are conceptually appropriate for what I was trying to convey in Private Practice. Some of the white vinyl pieces such as Strength and Valor were taken directly from the Adrinkra symbols. OPP: I imagine from the shapes of these pieces that quilting vinyl is unwieldy and difficult. What is it like to work with this material? When did you make your first quilted piece? SP: Yes, working with vinyl is quite a challenge. I have often described it as "wrestling alligators"! 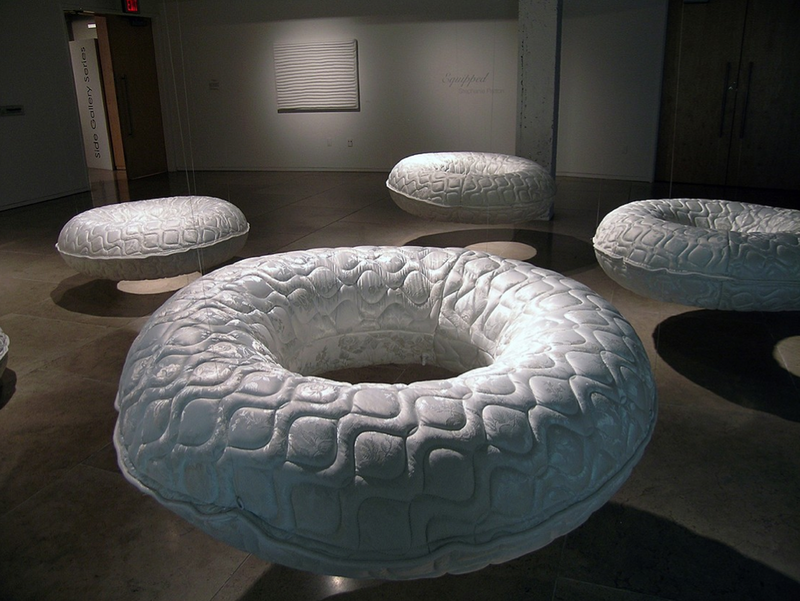 Years ago, I first used quilted fabric pieces for various installations. Satin was my fabric of choice. I made quilted satin walls for my 1996 thesis show while I was a while a graduate student at The School of the Art Institute of Chicago. These quilted walls lined a lingerie showroom which showcased fantasy lingerie products such as the Heart Filter™ and the Anxiety Guard™ by Renella®. In 2004, I used quilted satin to reconstruct the interior of a minivan for a project entitled Custom Built. Although I was still very interested in the idea of padding or cushions, I later discovered that vinyl was a more appropriate choice both in terms of its physical properties and its conceptual impact. Certainly the idea of padded walls comes into play. For me, these pieces allude to protective environments whether that is a reference to mental health and/or any soft, protective, physically-comforting space. My first stuffed, white vinyl piece, Protection (2008), hung flat against the wall. In 2011, I made Center Piece, which was more of a relief sculpture that pulled away from the wall. Today they continue to take various forms. I am interested in pushing the materials in ways that I have not yet encountered. OPP: Your videos Conquer (2013), Heal (2011) and Diffuse (2008) are embodied metaphors for emotional experiences that use language as a jumping off point. I also see a relationship to the trajectory of feminist performance art. Are you influenced by pioneers like Martha Rosler, Janine Antoni, Hannah Wilke and Marina Abromovic? If not, what has influenced you? SP: Although I highly regard all of these amazing pioneers and their great contributions to performance art, I cannot say that I was directly influenced by them. I consider my main influences to have come form various musical personas such as Dolly Parton and Loretta Lynn. I've also been inspired by female comedic players such as former members of the cast of Saturday Night Live including Gilda Radner, Molly Shannon, Rachel Dratch, Tina Fey and Amy Poeler. I LOVE the SNL men as well! I've been making videos since 1995 and had the opportunity to study various types of performance in NYC between 2000-2002 at the Upright Citizens Brigade, Gothum Writers Workshop and the New School. This amazing experience has informed my more recent video work. OPP: Do you have a favorite piece of your own work? Is it the same as the piece you consider to be most successful? SP: That’s a hard one! I am very attached to the white vinyl pieces at the moment. One of my favorites is Center Piece because of its visual simplicity and the discoveries that it has led me to. This piece was in fact the springboard for all of the white vinyl pieces that I am continuing to make today. A few of my other favorites are my video Diffuse and the sculptural works, Life Saver and Bronze SAS Shoes. Although it is hard for me to judge which of these would be representations of my best work, I do feel that Diffuse is one of my most successful videos. The others that I mentioned are successful to me in the sense that they are all very true to my visual and conceptual intent. OPP: You mentioned Renella as part of your MFA work. She’s your alter ego, a country singer, who, when asked in an interview what was inspiring about her trip to the Palace of Versailles, responded, "It's all about being fancy." She doesn't appear anywhere on your artist website, but I discovered her on your Vimeo page and found that she has her own Facebook page. It looks like she's had numerous public appearances in and out of the art world. Does she still perform? How does this character relate to your more recent sculptural and video work? SP: Renella is actually taking a well-deserved nap at the moment. . . she’s a character that I began to develop in 1992 when I did a performance of a fictitious wedding with fellow artist, Jack Rivas. I needed a name for the bride and Renella Rose Champagne was born! She married Junior Rivas on April 17, 1992. This was a huge collaboration for me. It involved an eight-month engagement, many traditional parties and bridal events along the way, and the wedding itself was attended by 150 guests. I have pursued several major projects and have done many performances in and out of the art world as this character including the lingerie showroom I mentioned. In 2005, I chose to devote my creative energy to my multidisciplinary studio work. 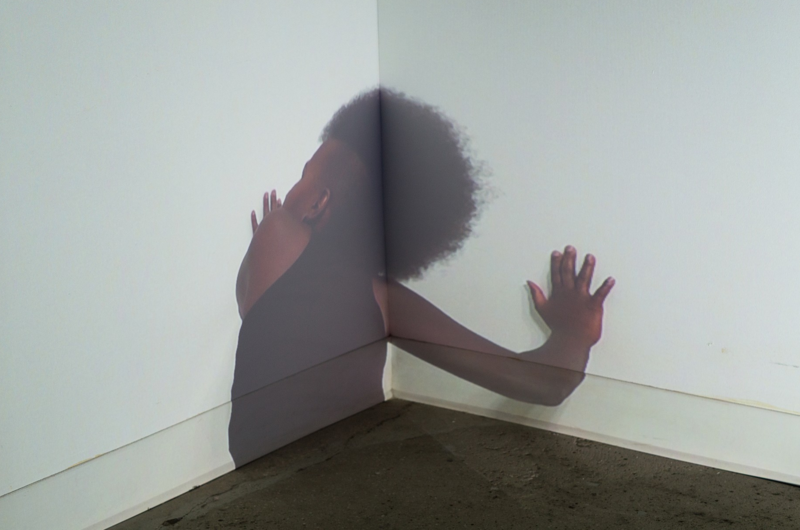 Although Renella is not visually present in the current work, there is a sense of her ongoing spirit throughout my sculptural and video work. I am certain that she will find her way more directly into my work again someday. Renella has a way of making an appearance when least expected! To see more of Stephanie's work, please visit stephaniepatton.com. Featured Artist Interviews are conducted by Chicago-based interdisciplinary artist Stacia Yeapanis. When she’s not writing for OPP, Stacia explores the relationship between repetition, desire and impermanence in her cross-stitch embroideries, remix video and collage installations. She is an instructor in the Department of Fiber and Material Studies at The School of the Art Institute of Chicago, where received her MFA in 2006, and was a 2012-2013 Mentor-in-Residence at BOLT in Chicago. Her solo exhibition I Still Haven’t Found What I’m Looking For at Klemm Gallery, Siena Heights University (Adrian, Michigan) just closed, and she is currently preparing for another solo exhibition titled Everything You Need is Already Here (Heaven Gallery, Chicago) in January 2014.